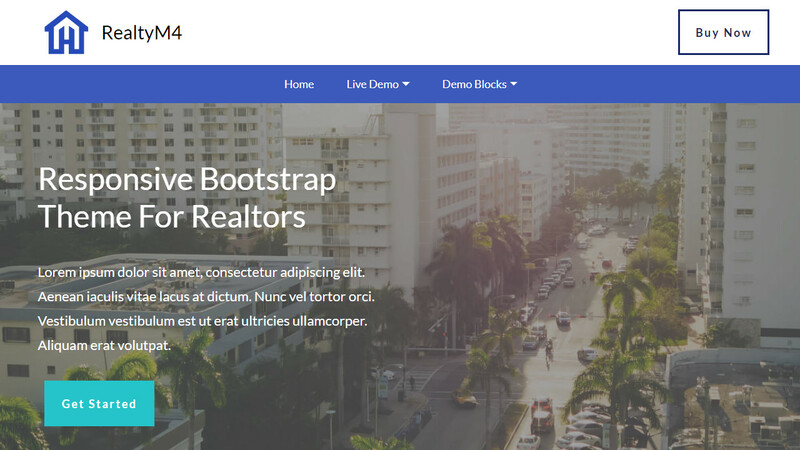 Now Bootstrap 4 as the latest and most used version of the most powerful Bootstrap Framework has got even more popular in 2019. 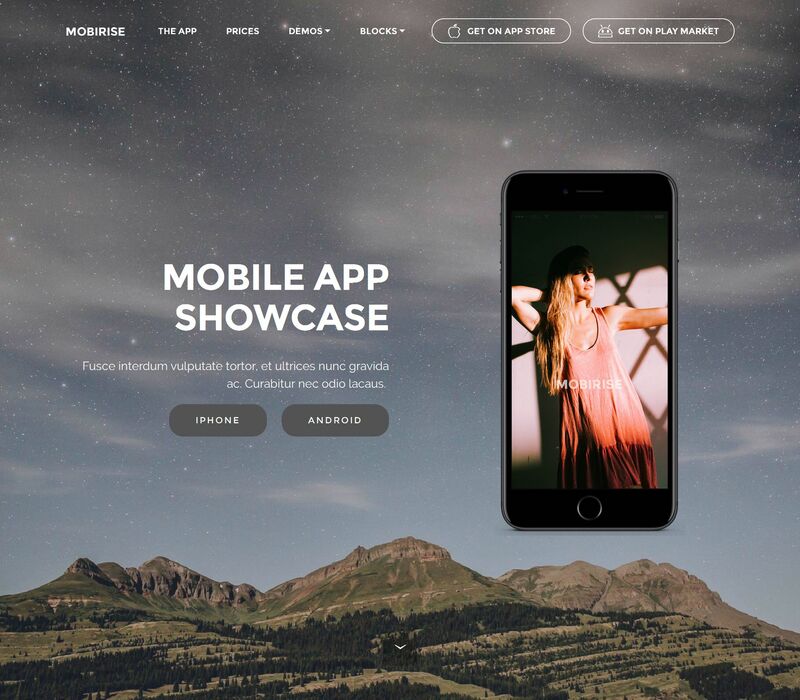 The largest, user-friendly and mobile-optimized framework gives us opportunities to create responsive websites more effectively. 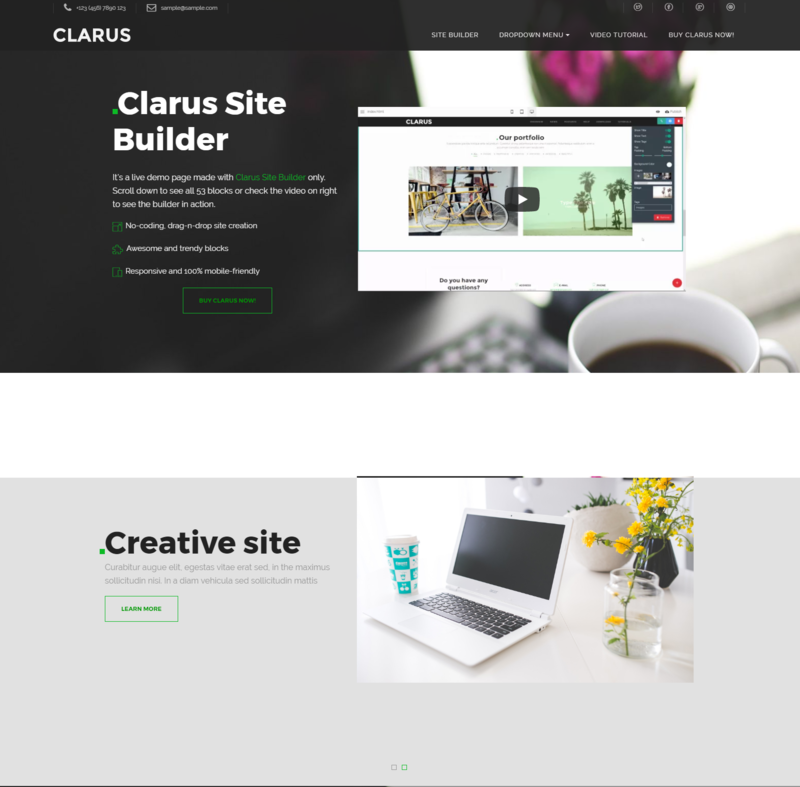 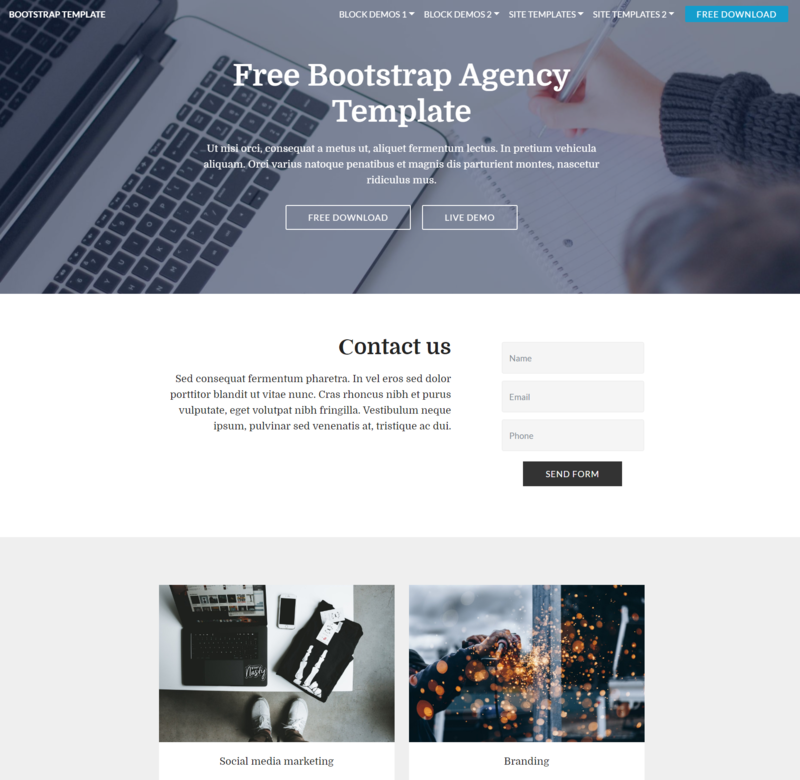 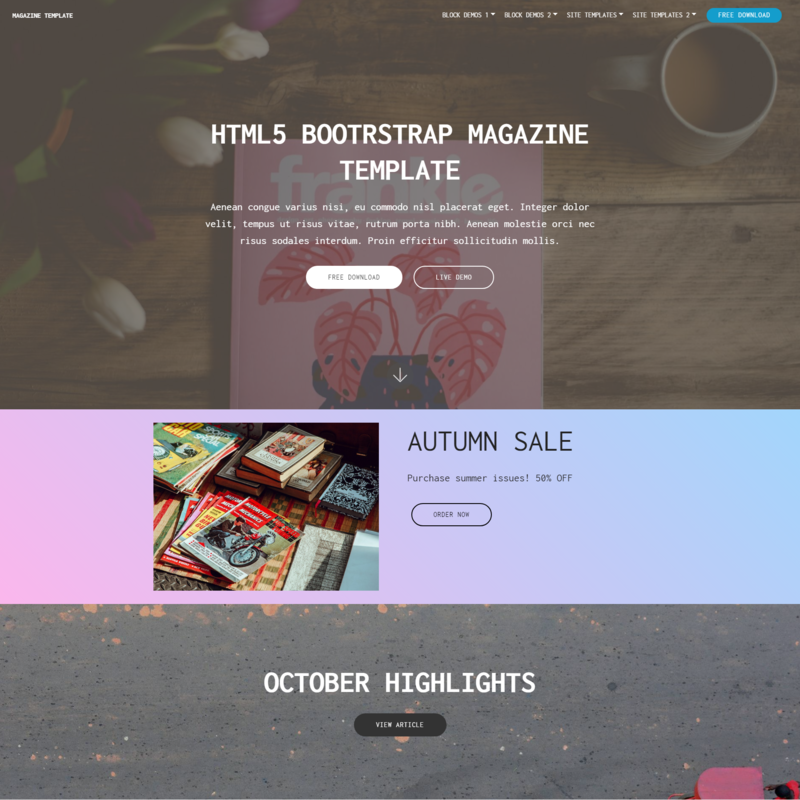 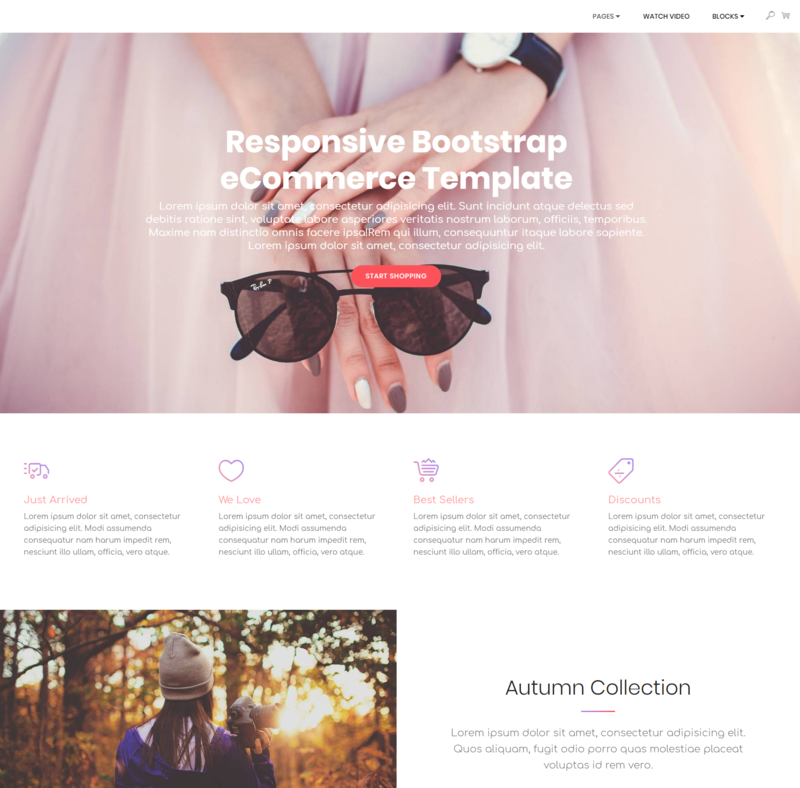 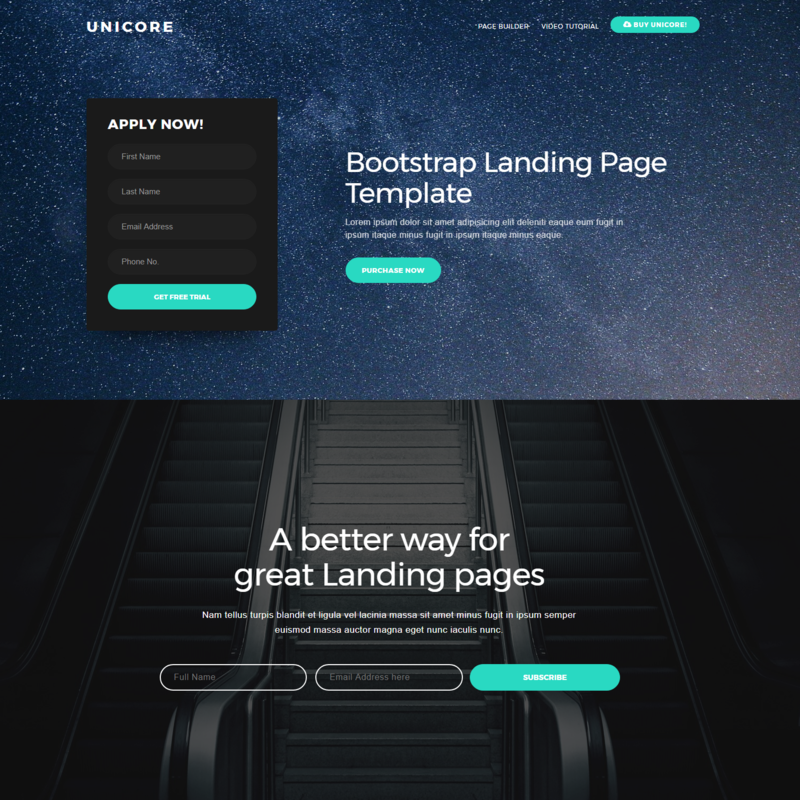 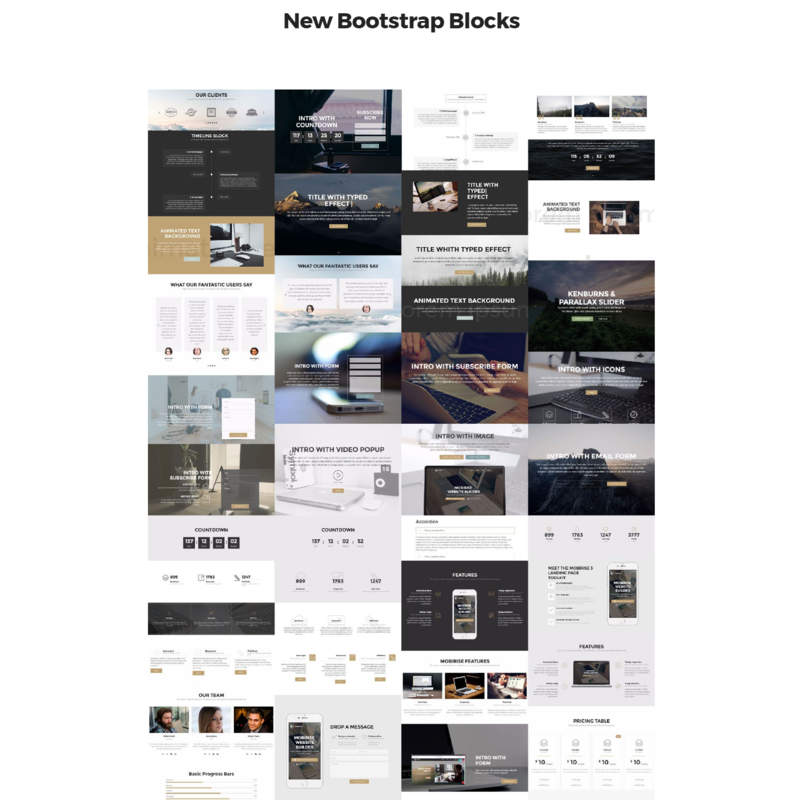 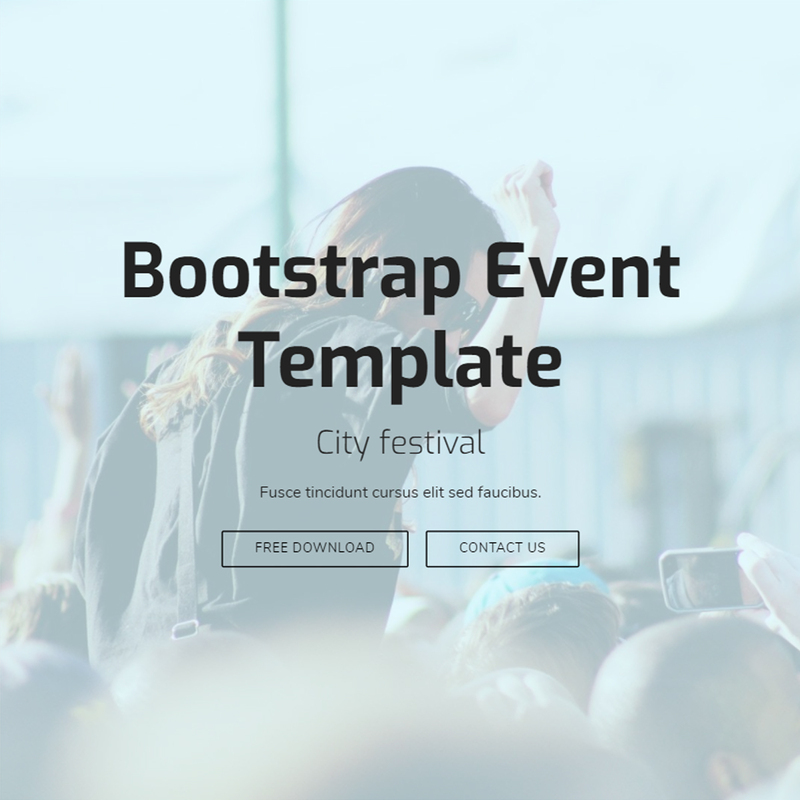 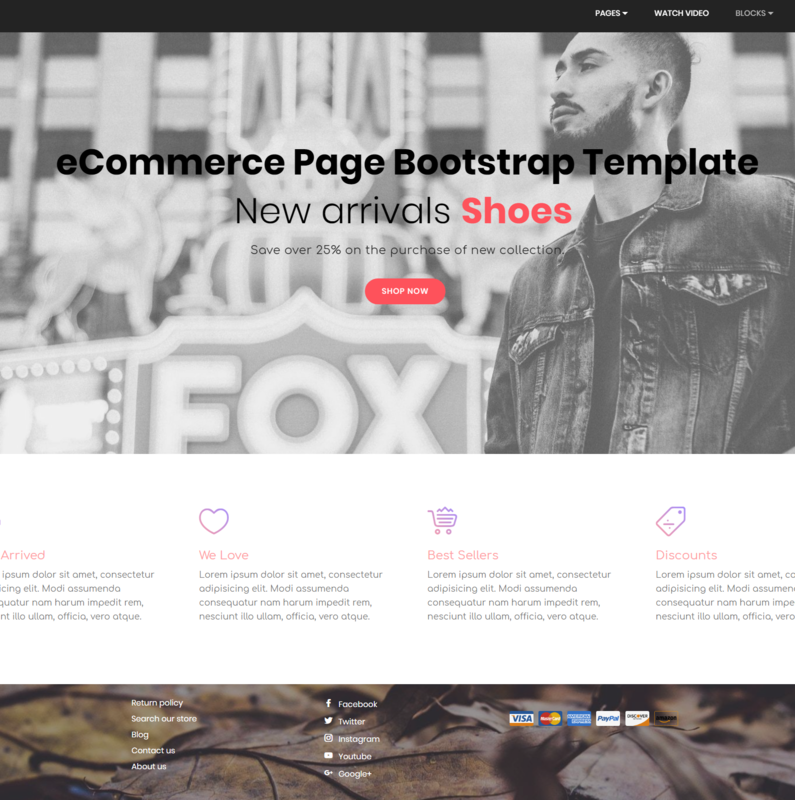 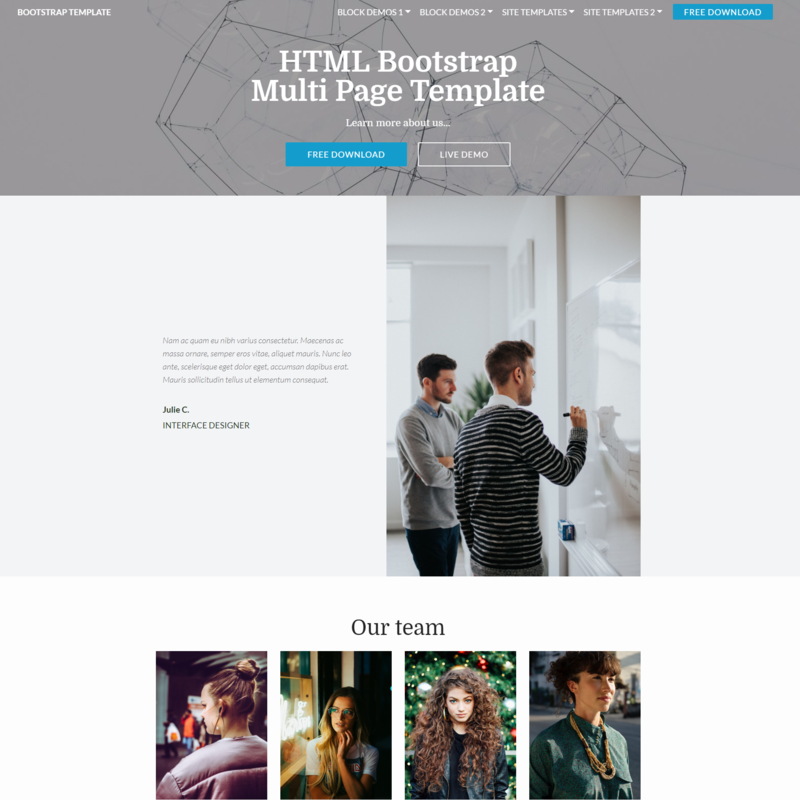 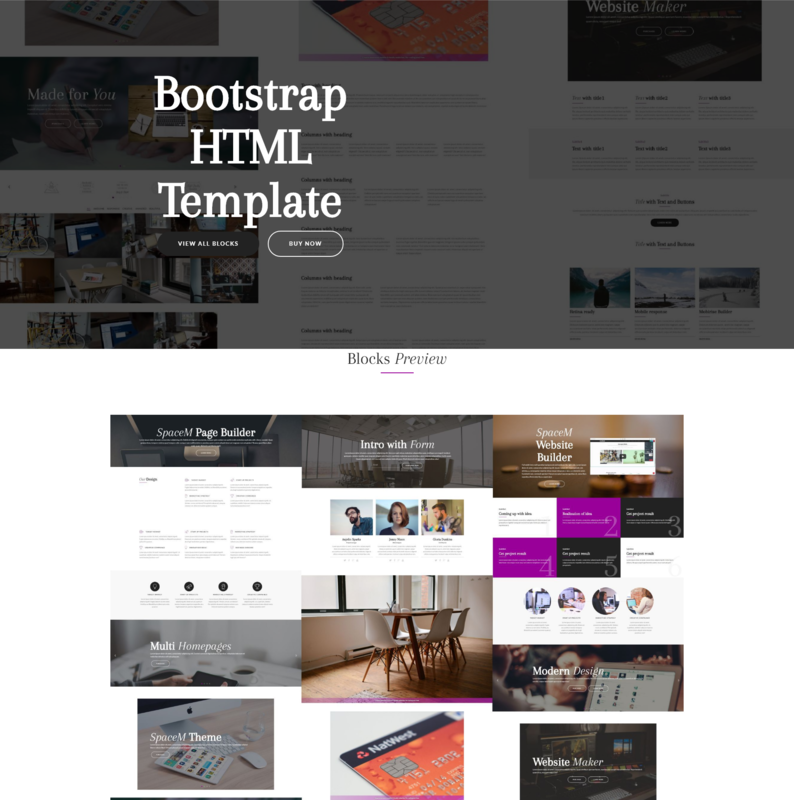 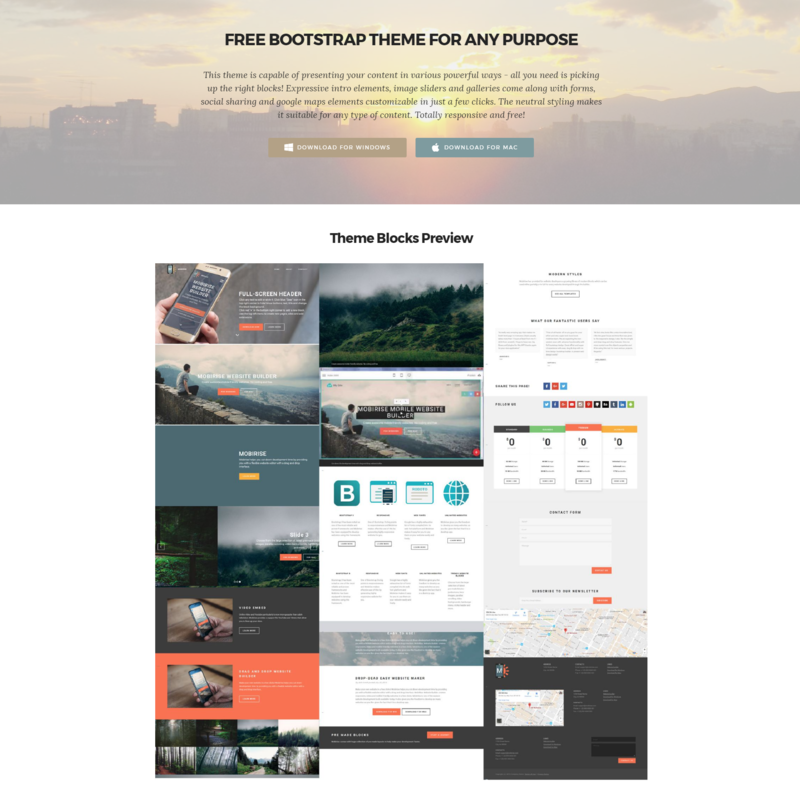 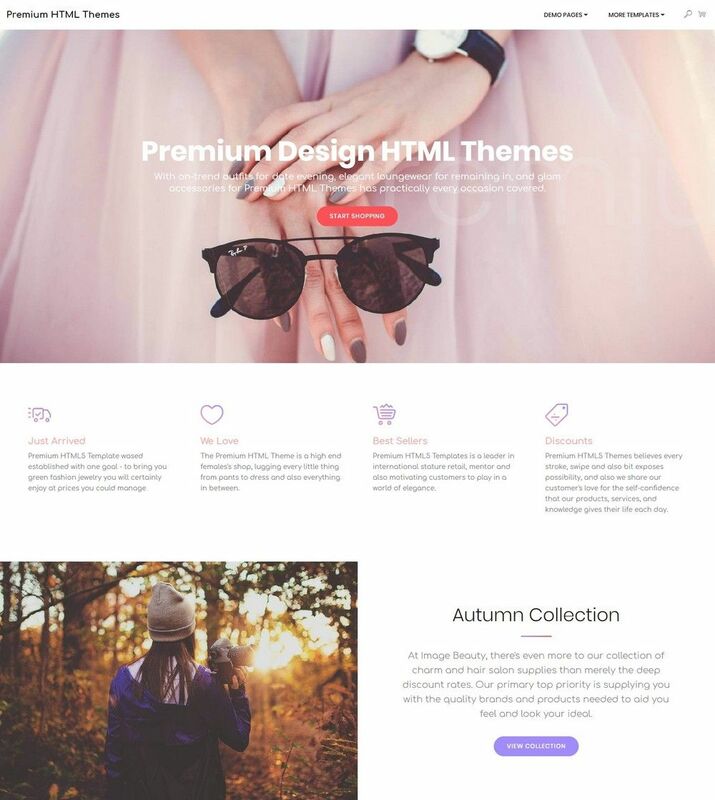 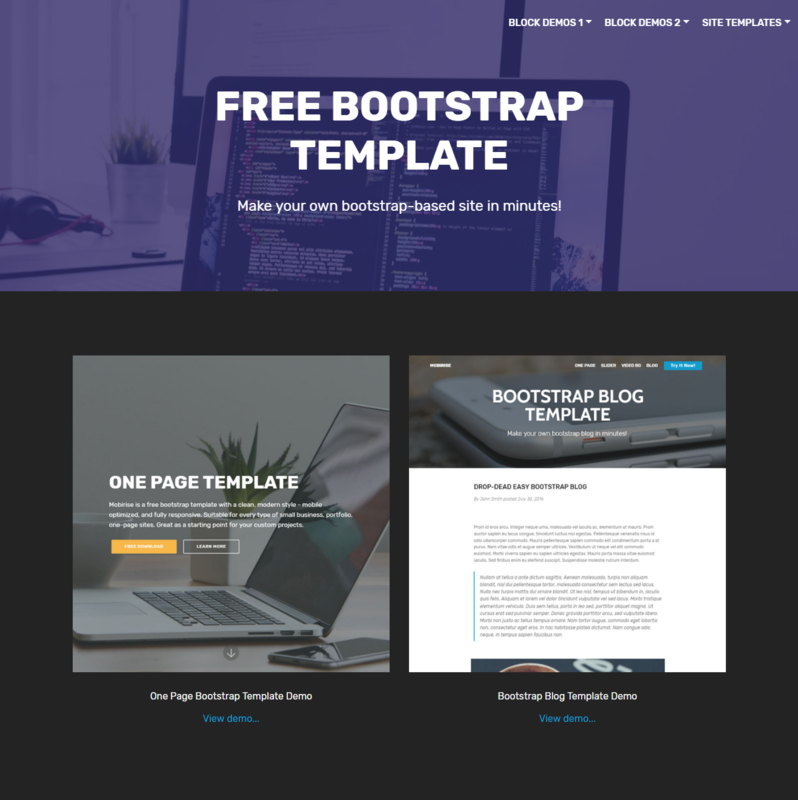 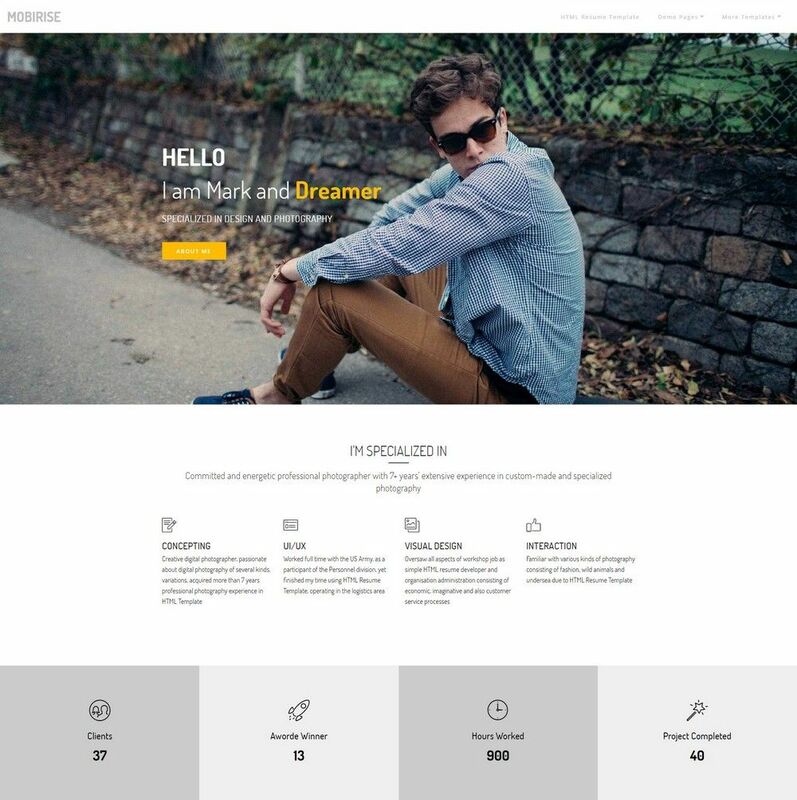 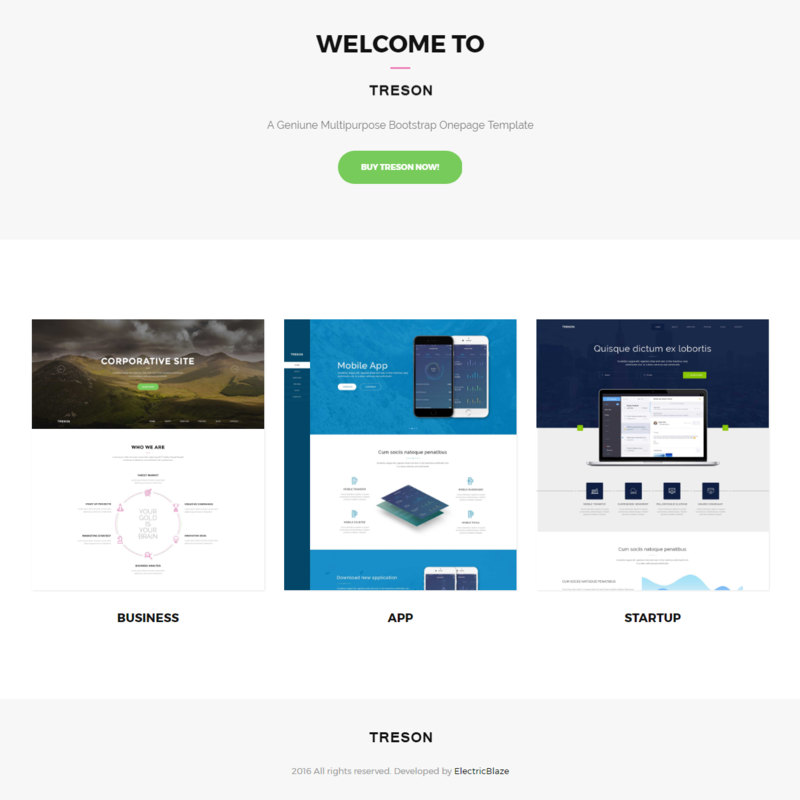 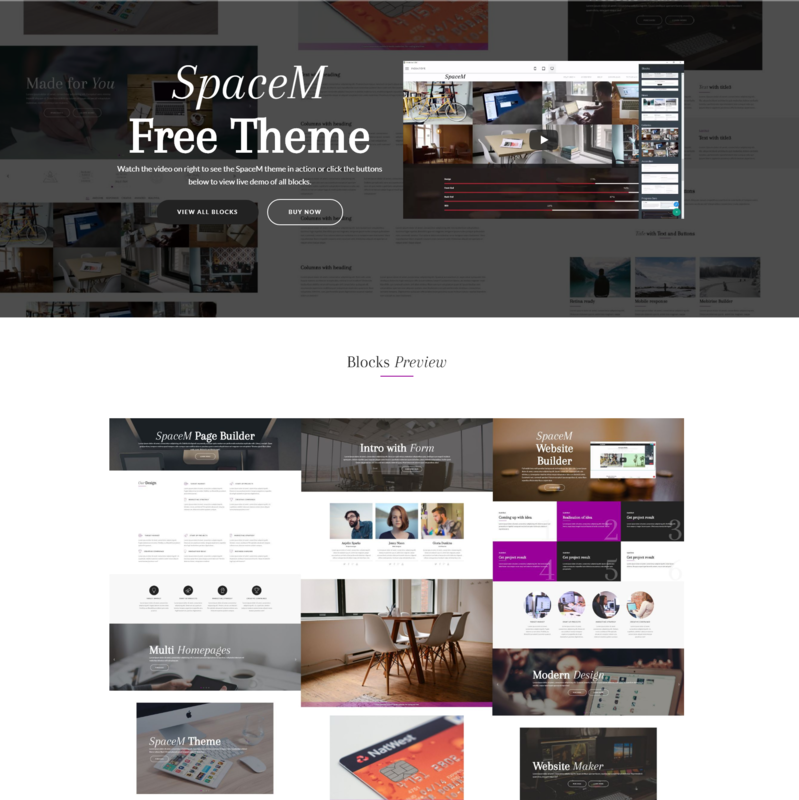 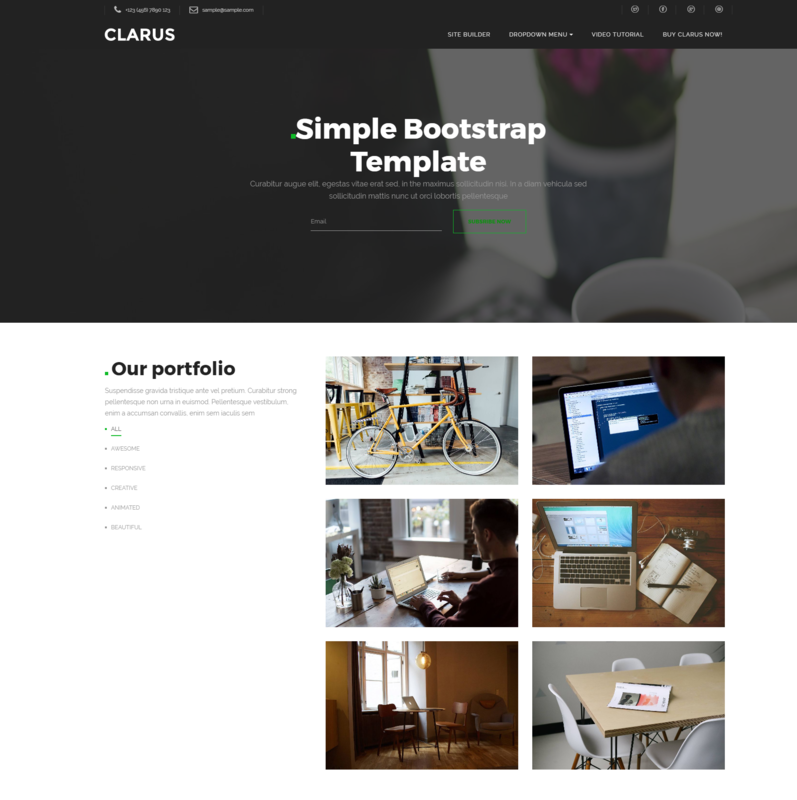 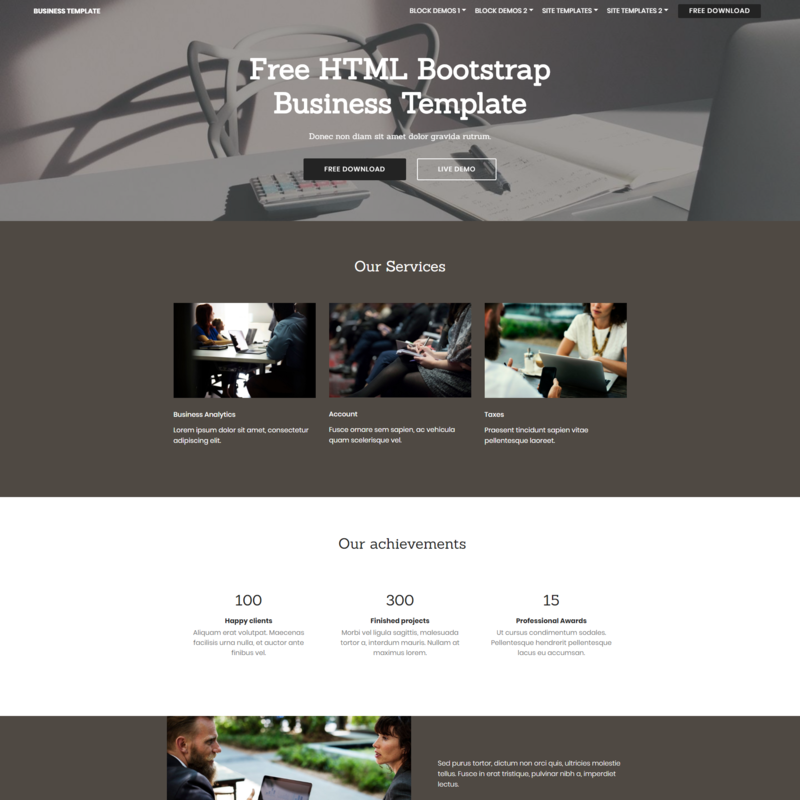 Now I introduce the best free Bootstrap website templates which are going to be the top themes of 2019 in terms of its design. 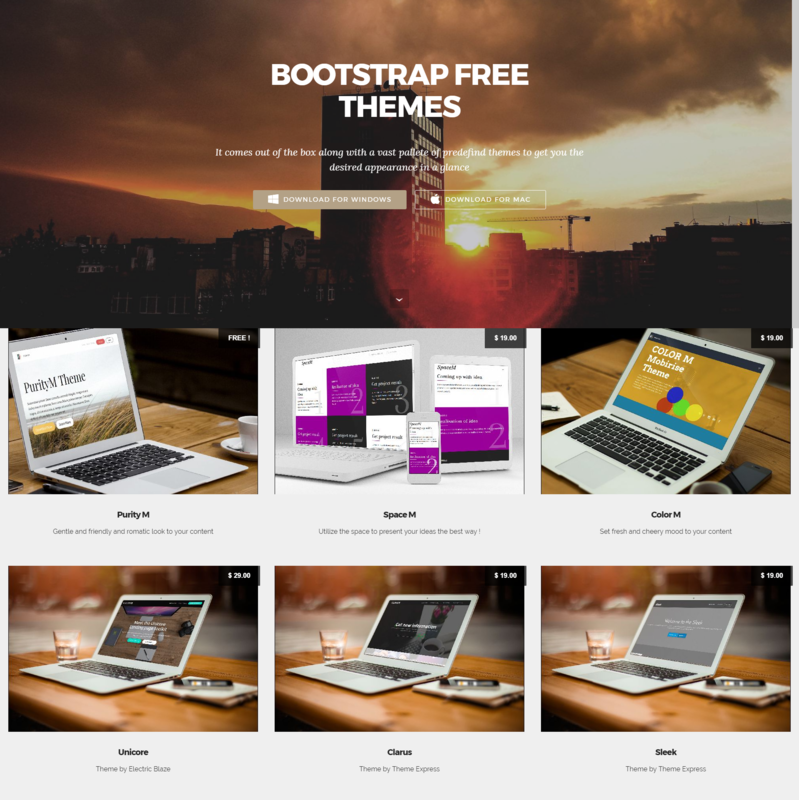 These themes have various differences - some of them allow a high level of customization, the others let us easily refine particular details. 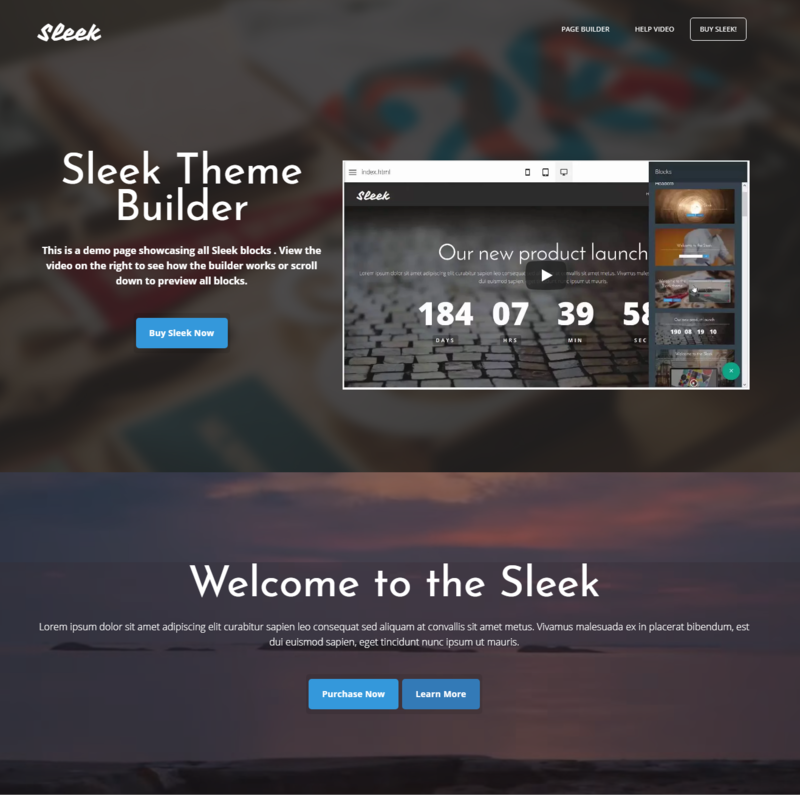 These themes might look simple yet effective and they enable you to create any type of website just like that. 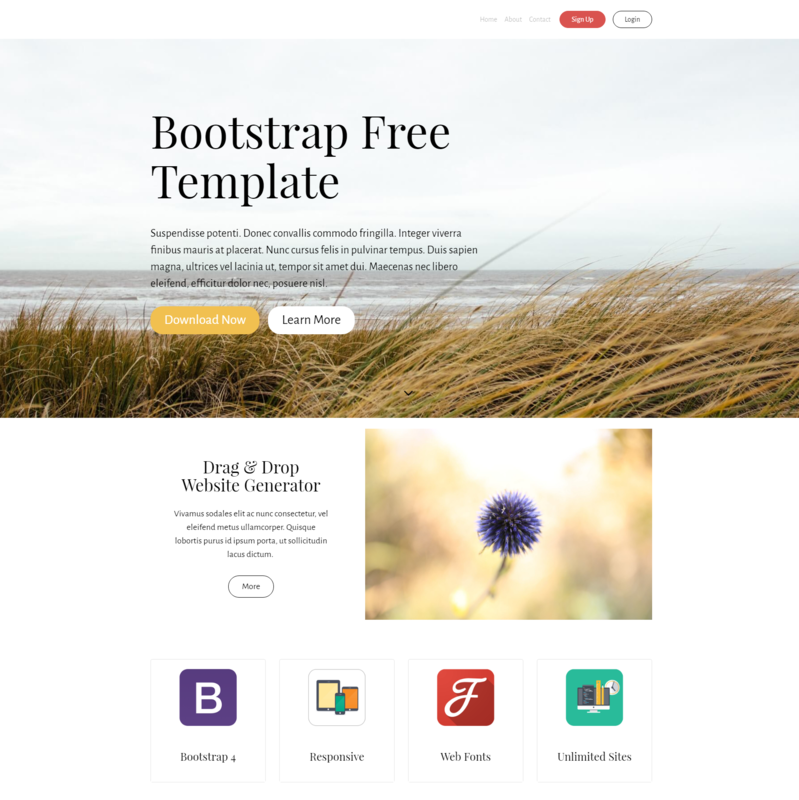 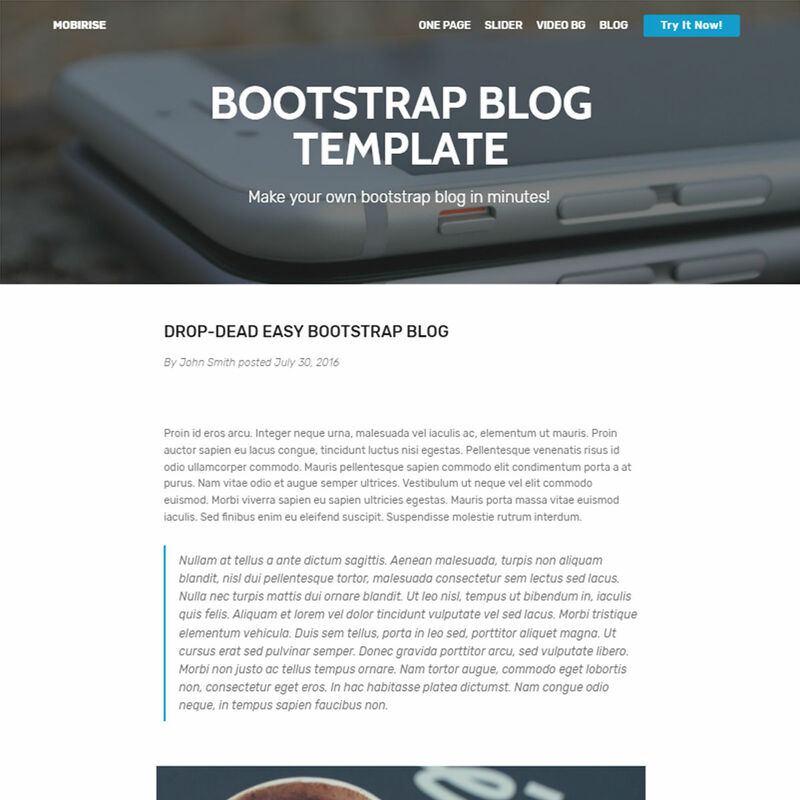 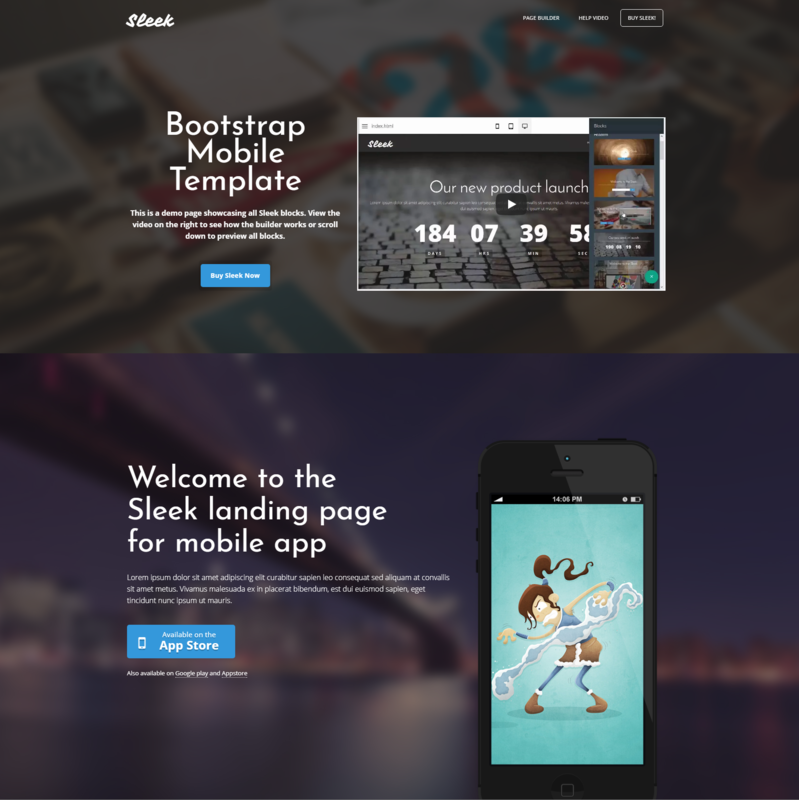 Bootstrap is what makes these themes responsive and mobile-optimized. 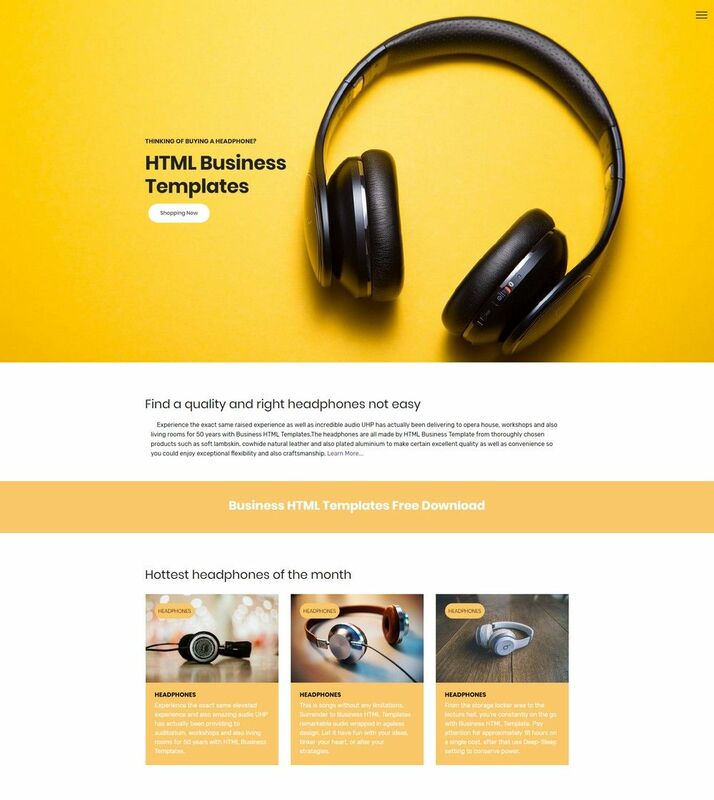 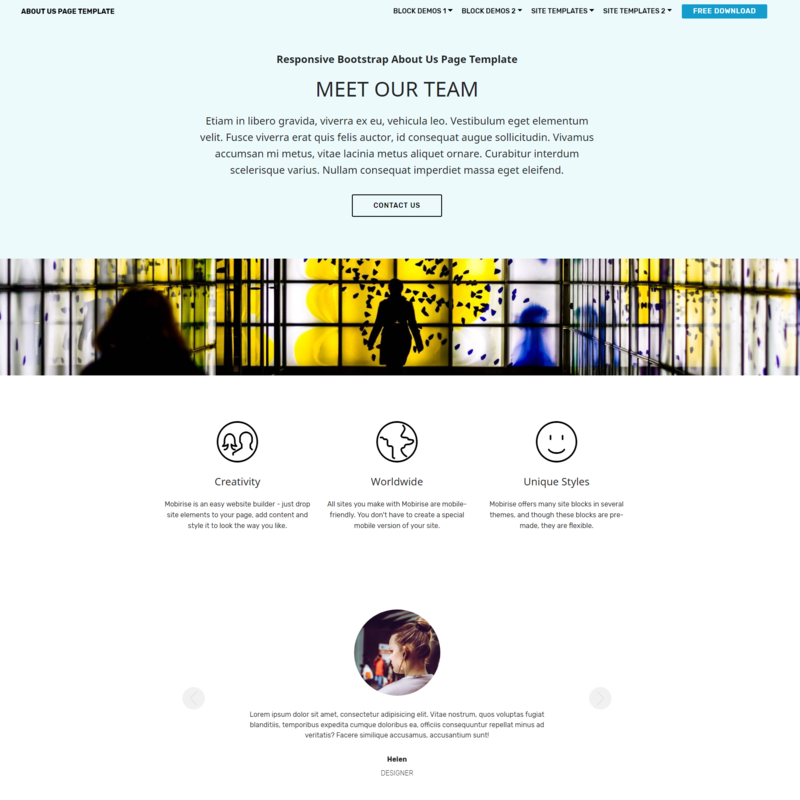 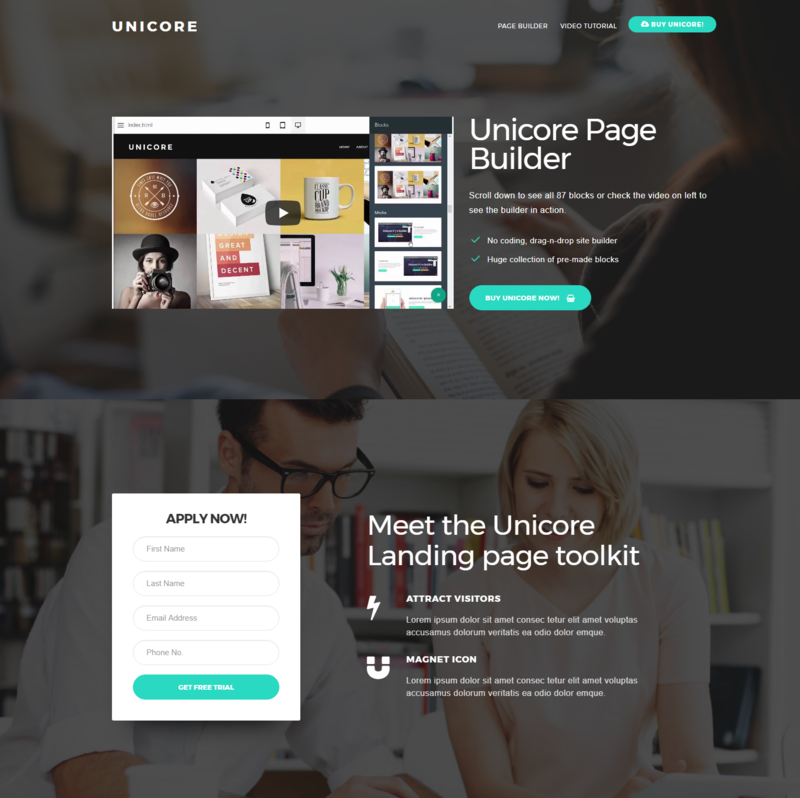 This is a universal website template for any branch and business field exemplified by a landing page for a creative agency. 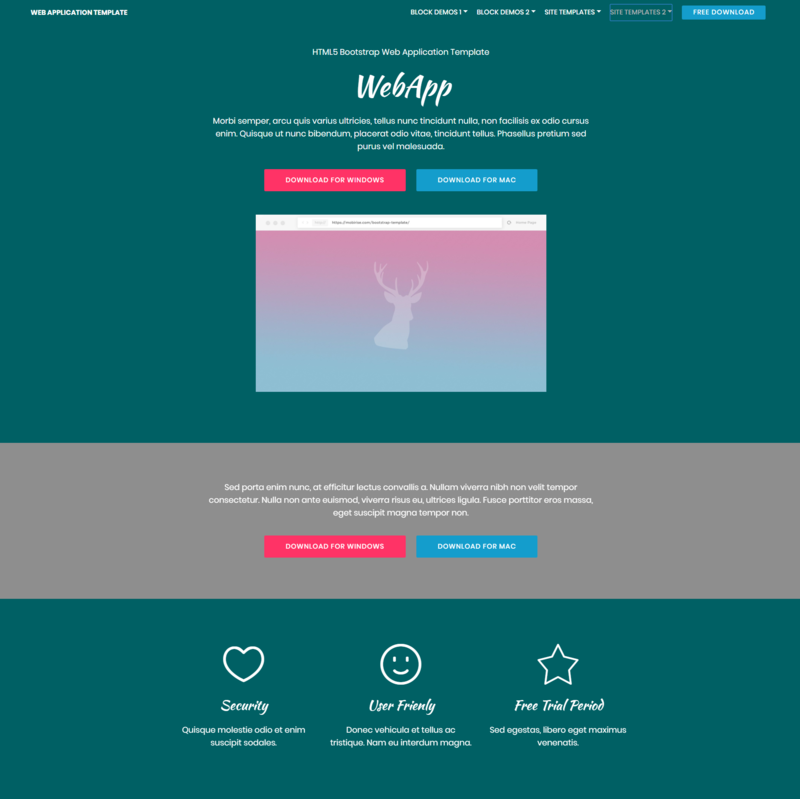 This light template with a pleasant color scheme will excite any person that visits your website. 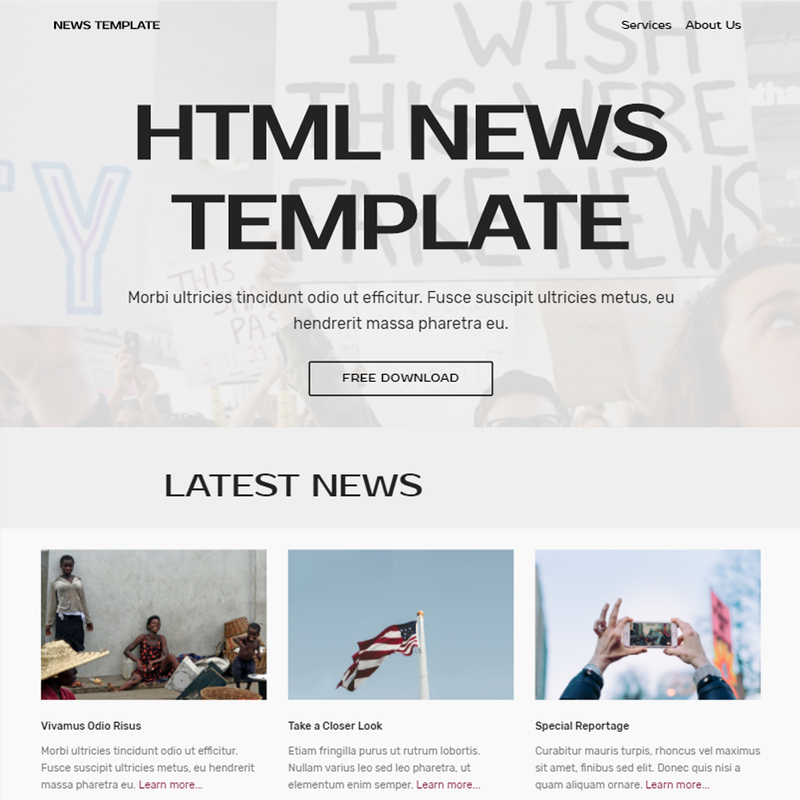 With a drag and drop HTML editor, you will be able to construct your own website from scratch using sections from this creative agency template and modifying them with ease. 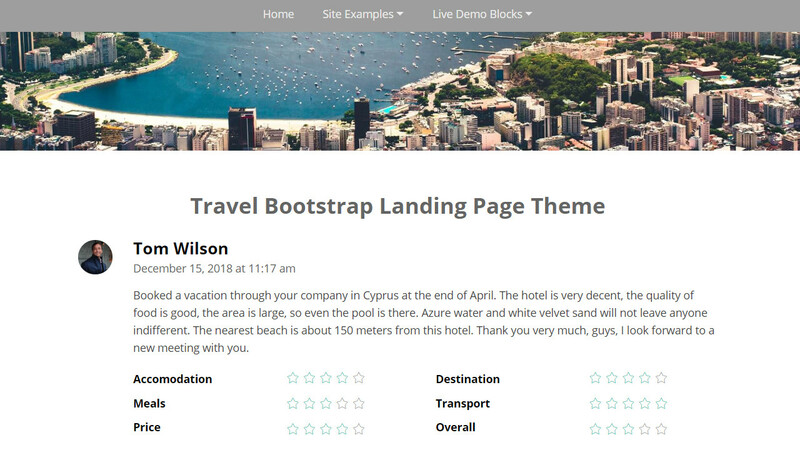 For those who own a travel agency, there is this Bootstrap theme. 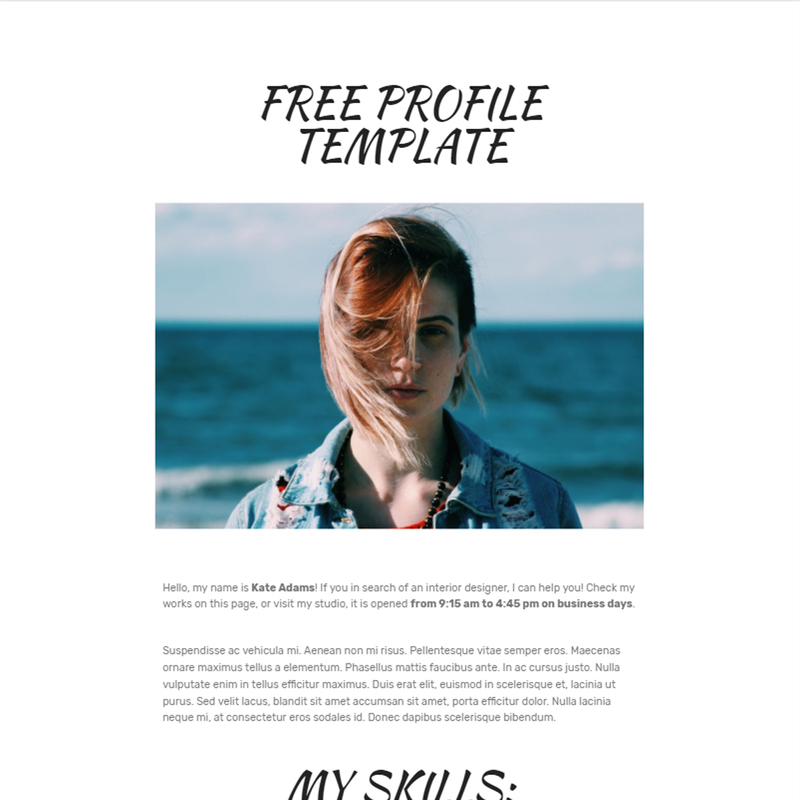 This template design will lure your audience to dive into your website content that warrants the growth of your site traffic. 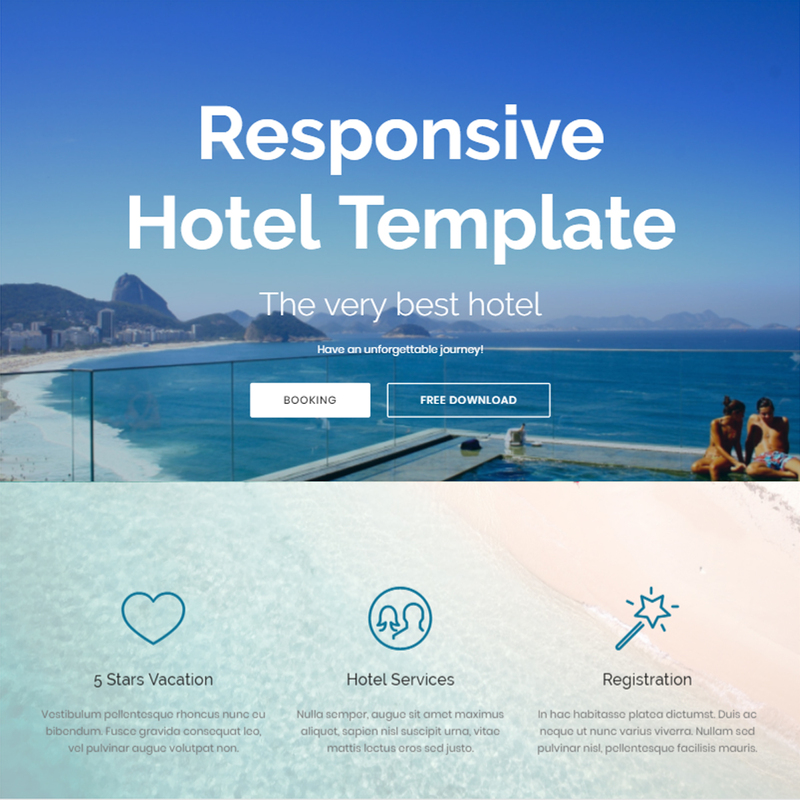 You will effortlessly show your travel tours to your customers and inspire them with your unusual and breath-taking layouts. 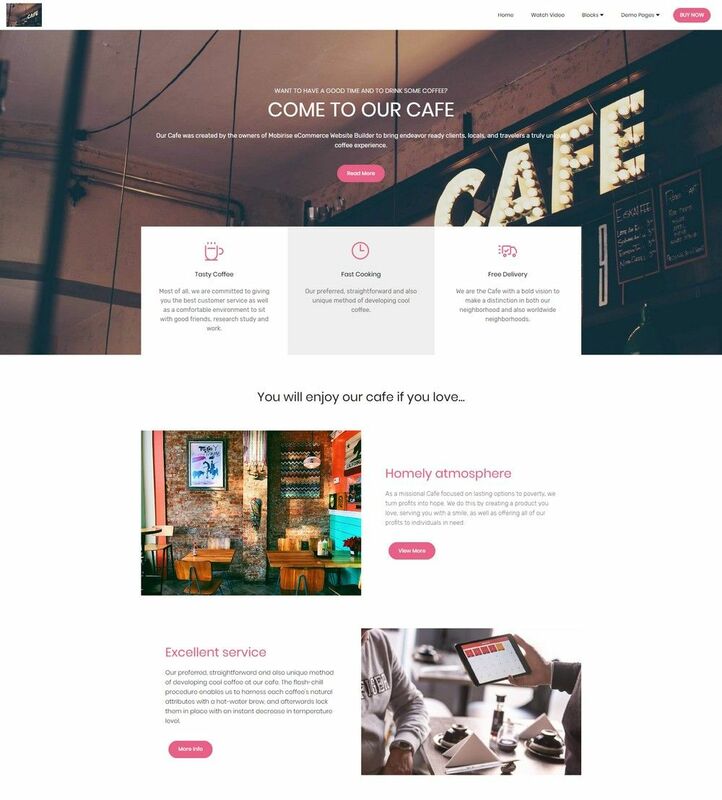 If you want to have a website to sell or rent flats to people, this example is the perfect fit for you. 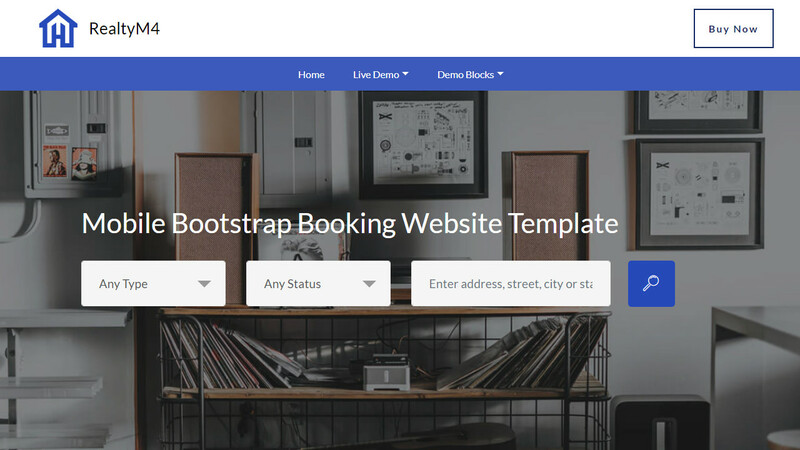 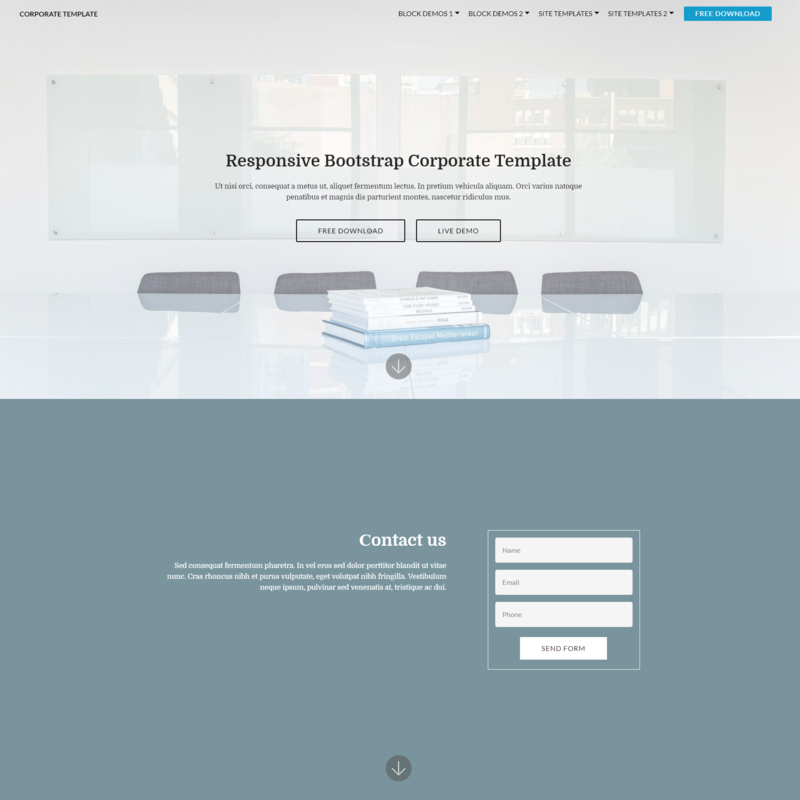 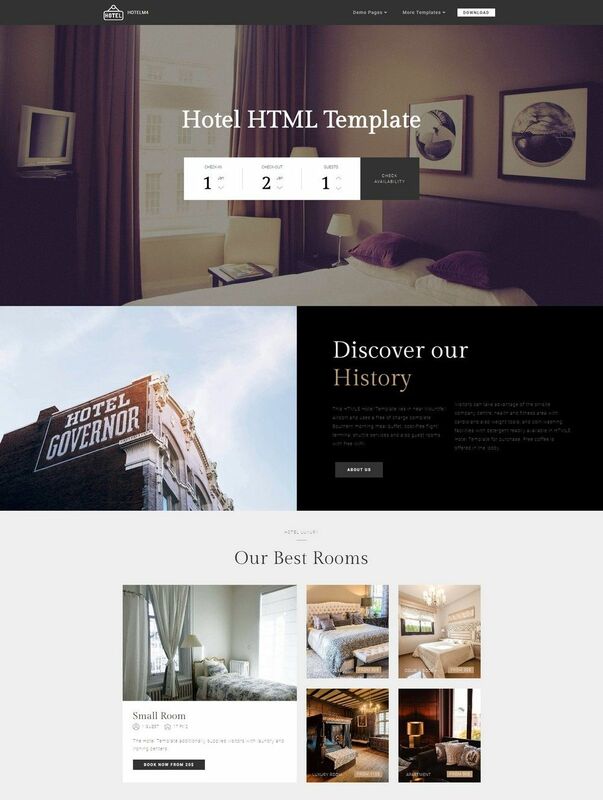 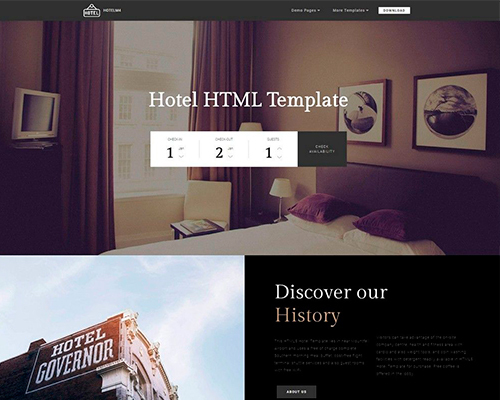 Based on an easy frontend page builder, the Booking website template is utmost user-friendly. 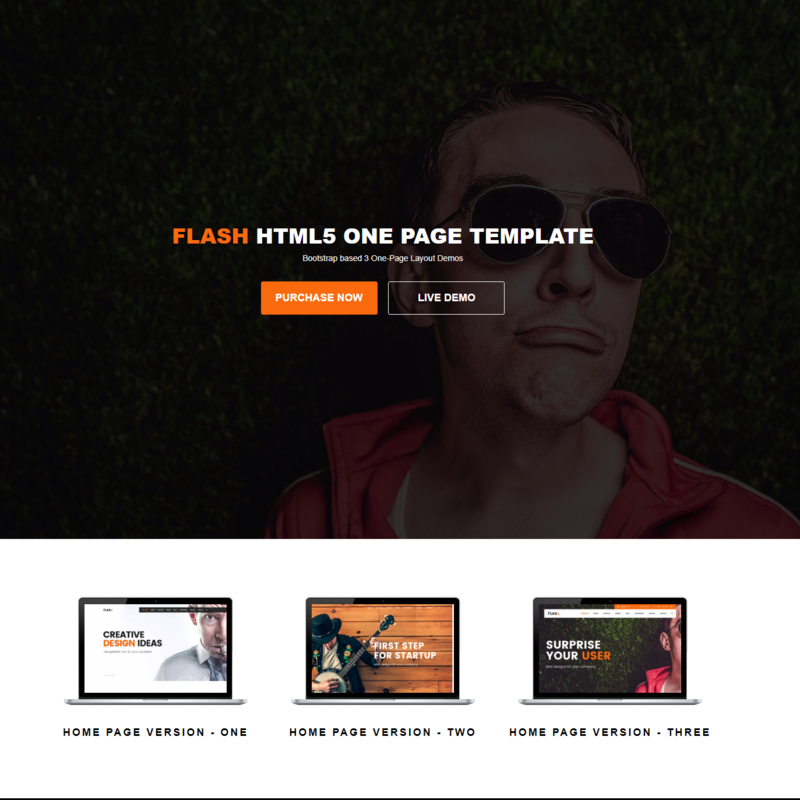 It saves you lots of effort and time due to its management simplicity and drag-and-drop features. 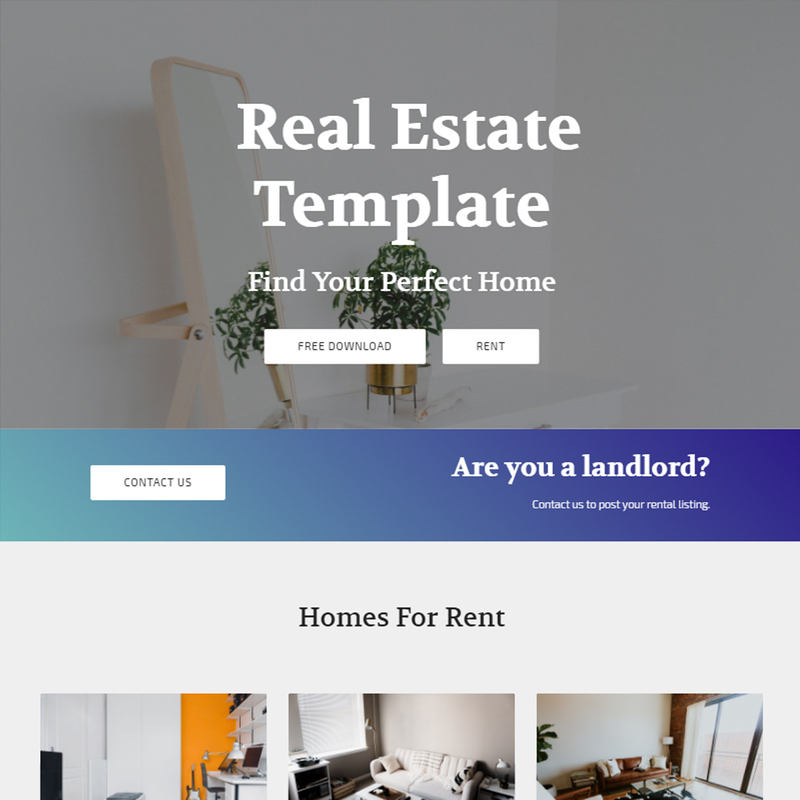 This is a contemporary real estate template with a simple and sleek design. 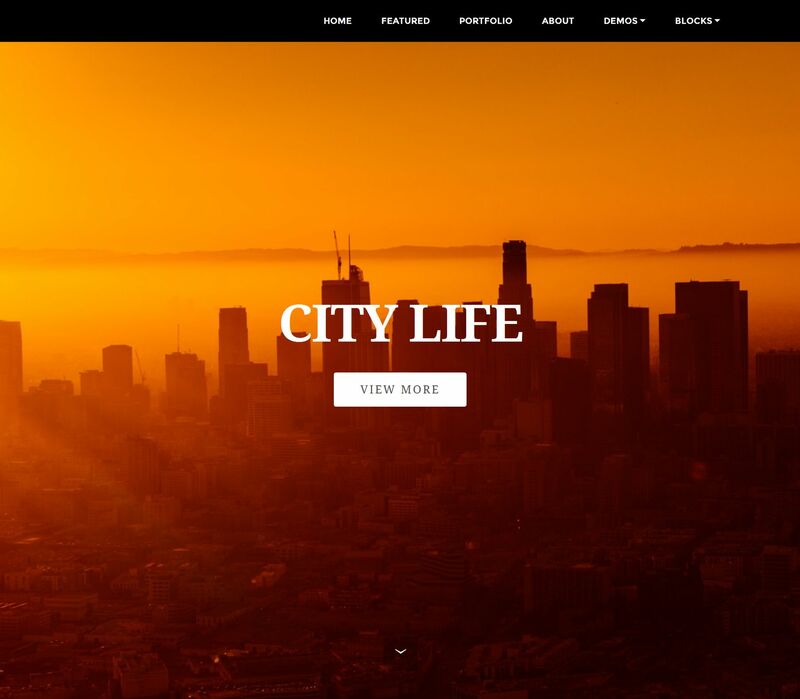 It allows you to have such sections on your website as apartments for rent or sale, search for available apartments, popular places, real estate agents, testimonials and others. 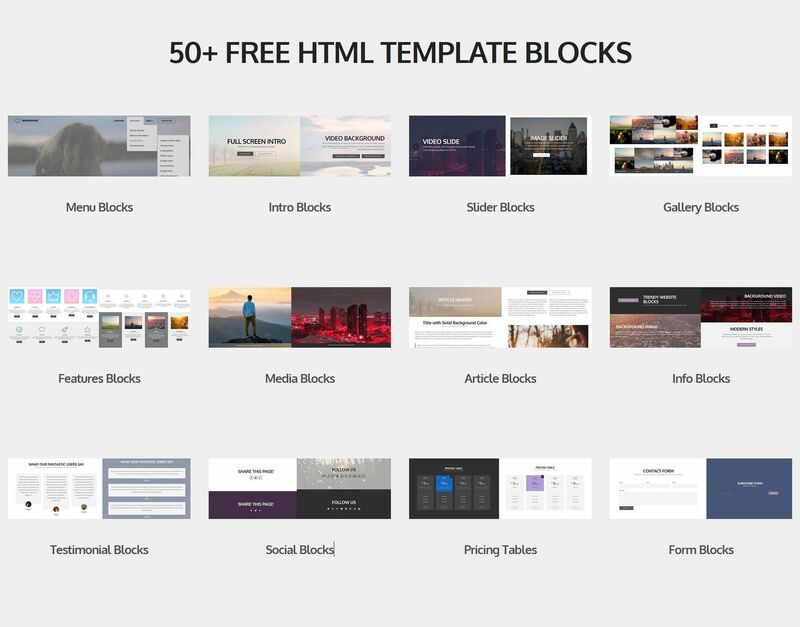 With a few clicks, you're able to drag and drop any of these blocks and edit it in an uncomplicated manner. 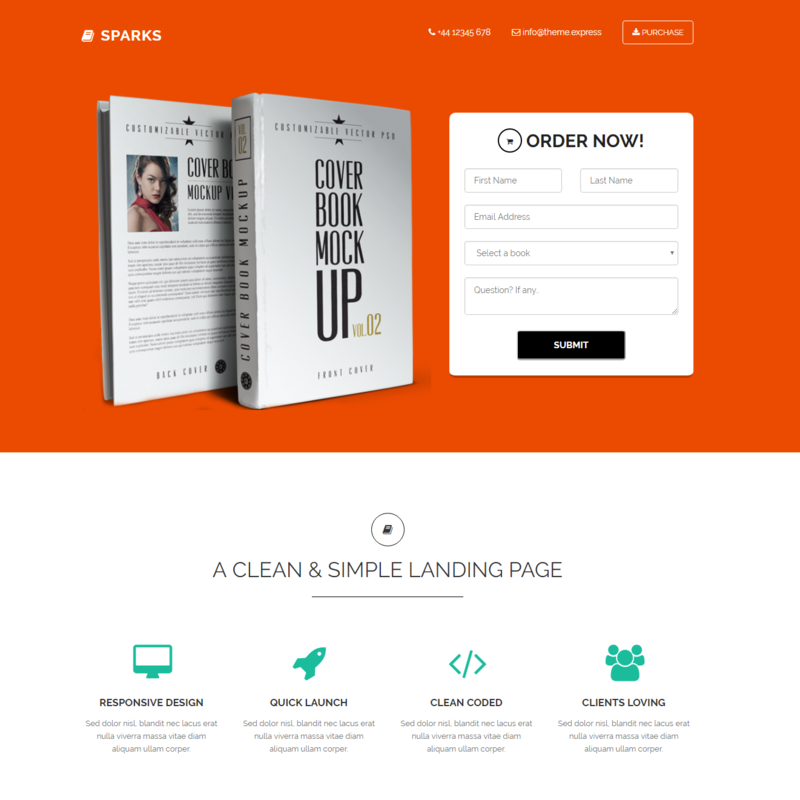 To start online courses, there is no need in systems you don't understand anything about. 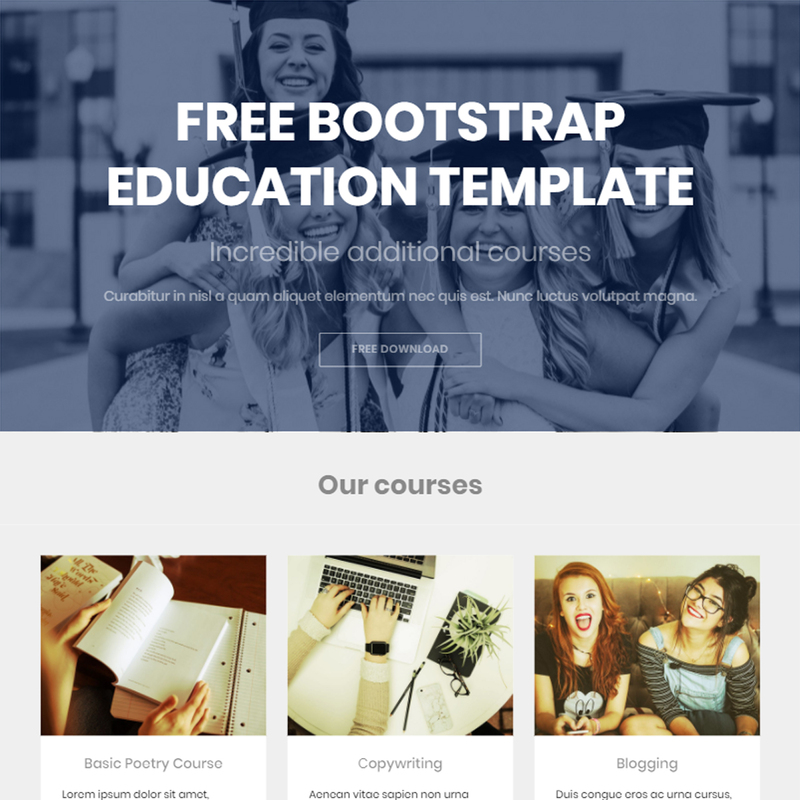 Just use this template to build a courses web page as naturally easily as it gets. 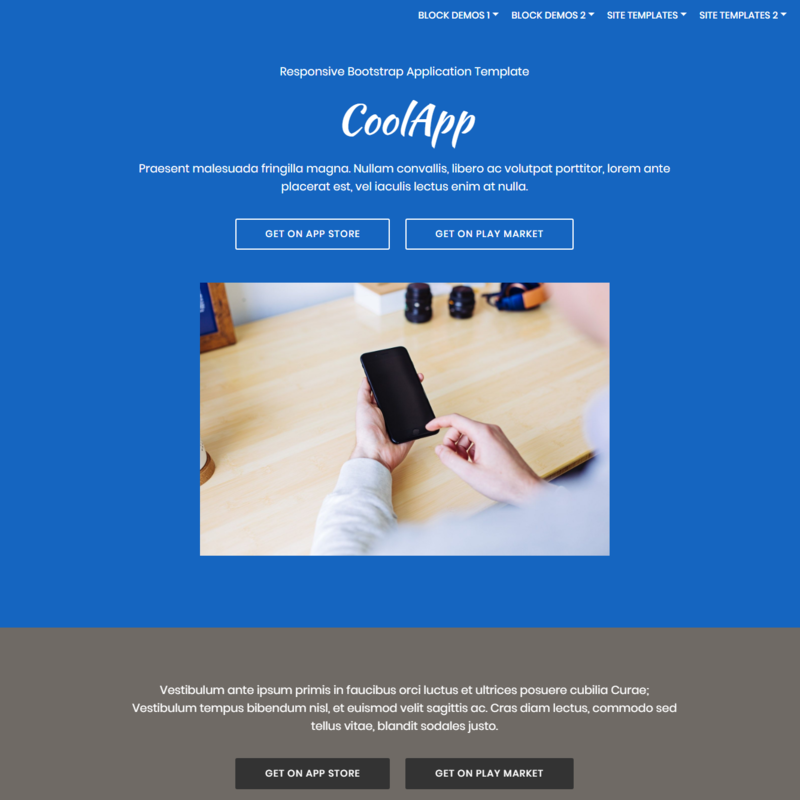 Using it, you will quickly put information of your educational institution, course categories, schedule, call-us sections, teams, and others. 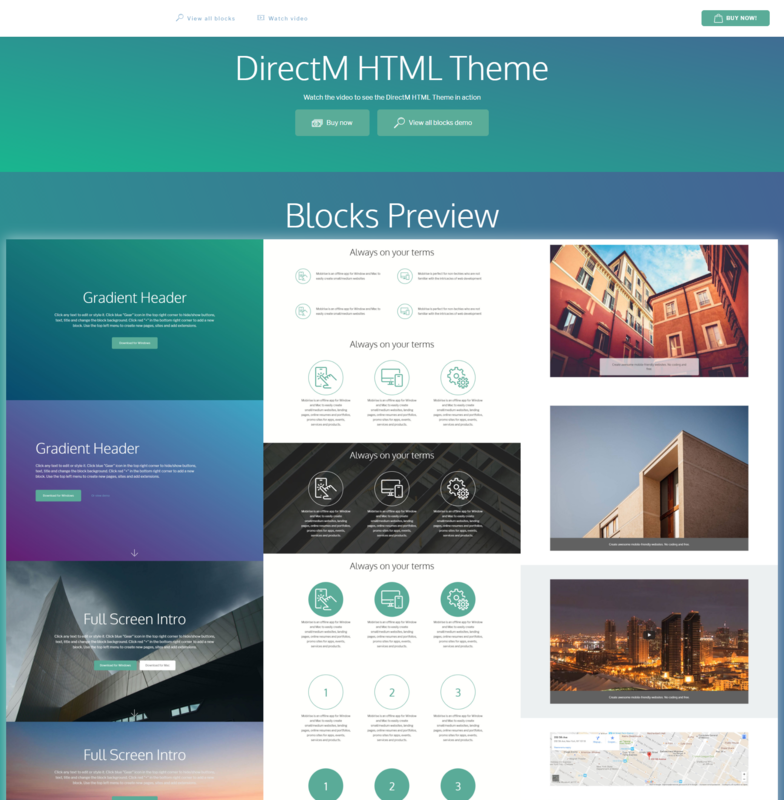 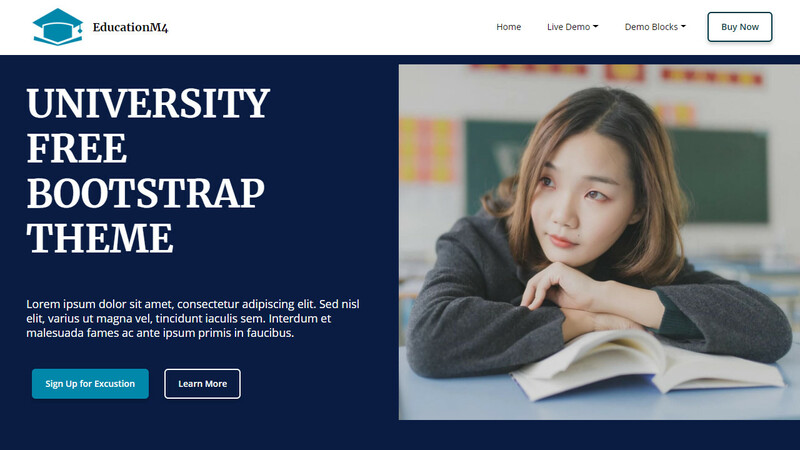 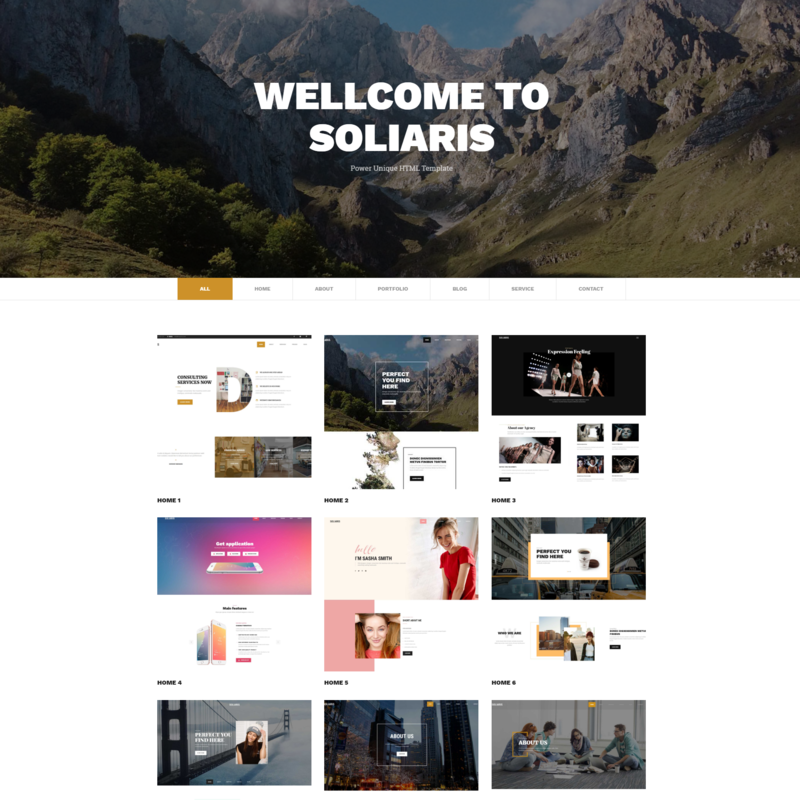 This is a full-featured neatly designed and modern looking educational website template with everything a professional school or university web page must have. 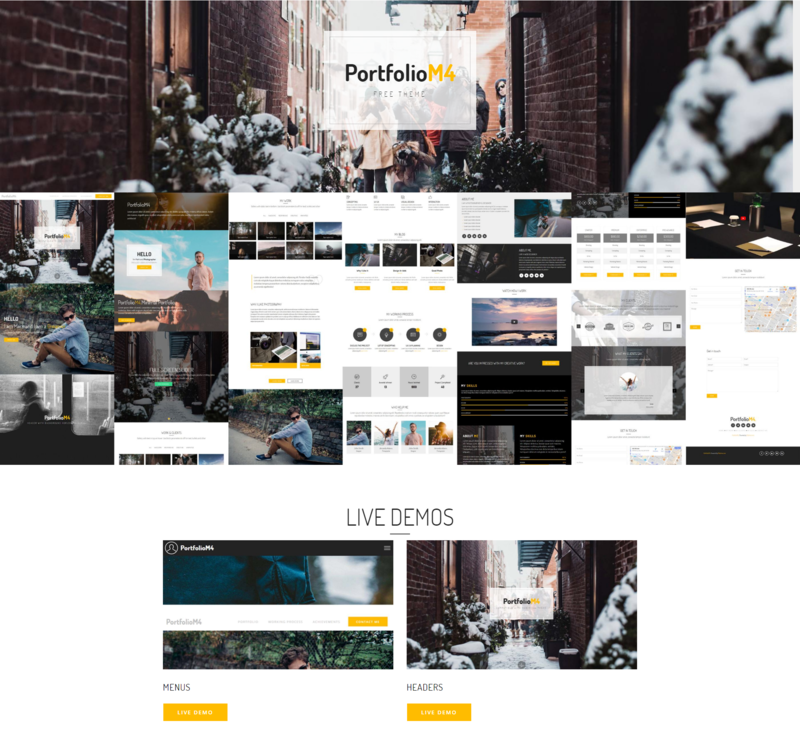 With a sticky menu, minimalistic header, blocks for featured programs and information on the university, a gallery with a responsive lightbox and other sections, this template is fated to be the best solution for you. 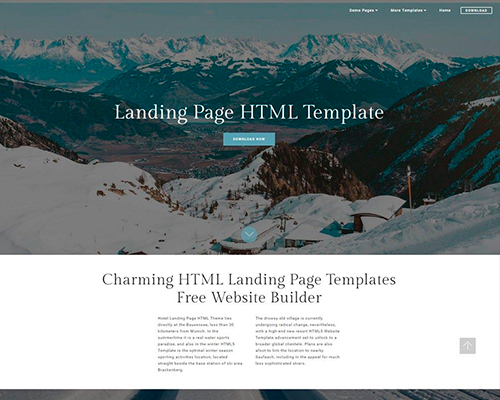 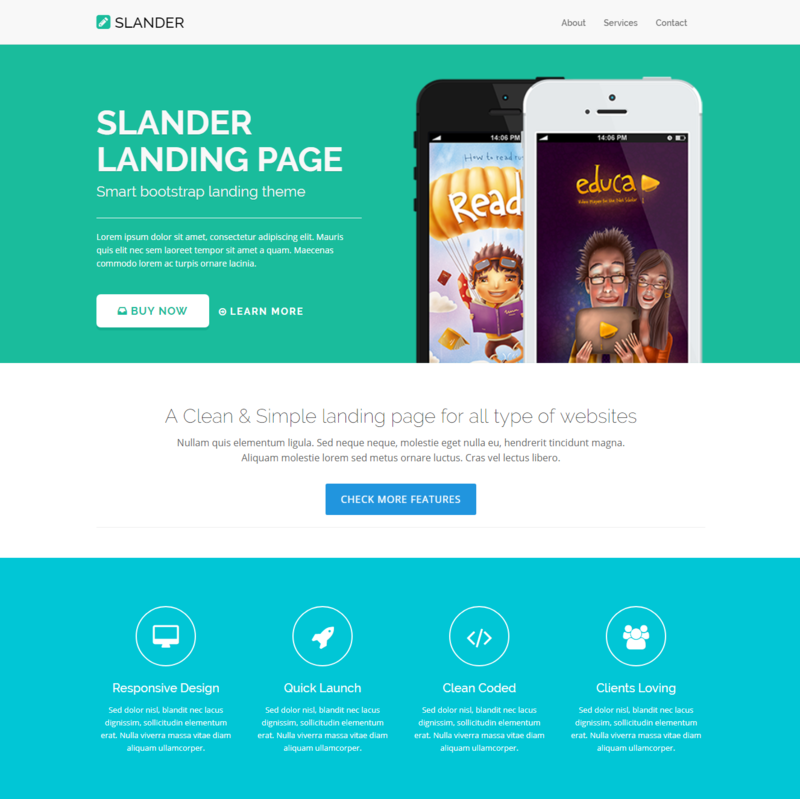 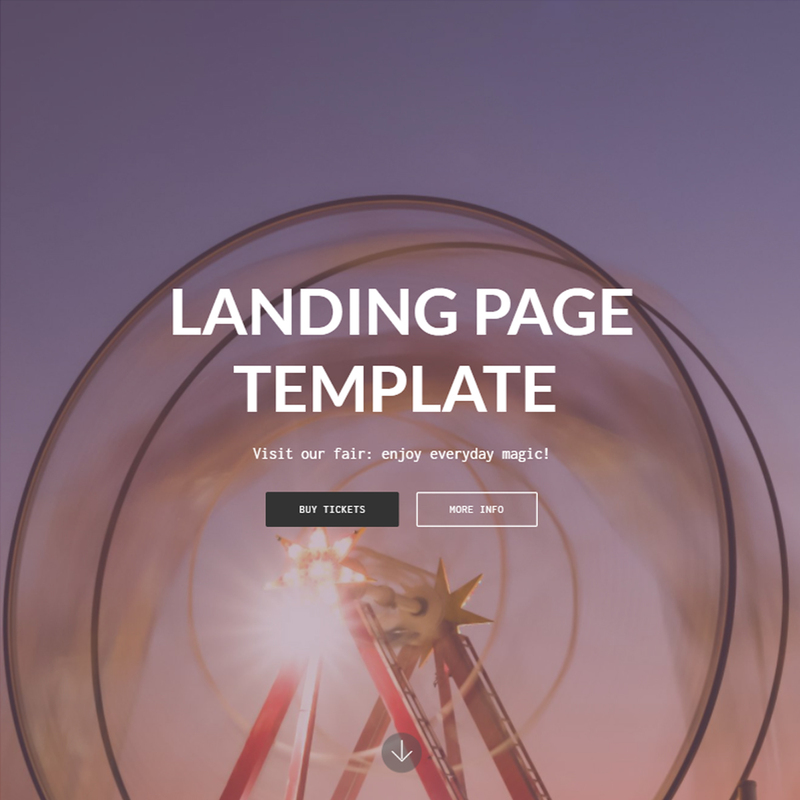 This landing page template is based on Bootstrap 4 framework that stands for responsiveness and adaptability. 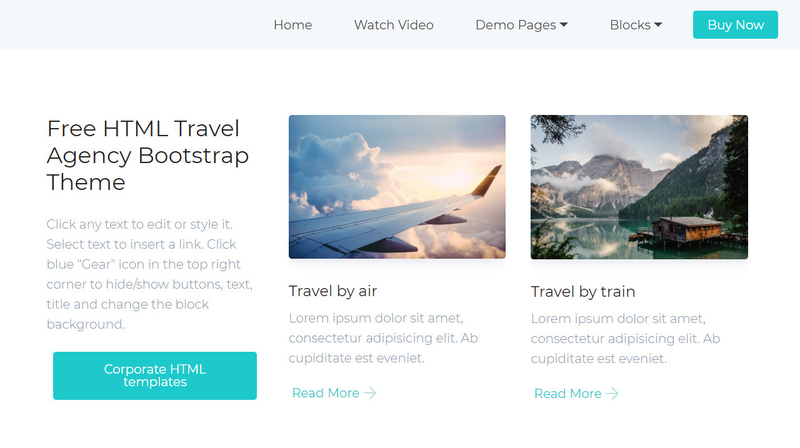 The design of this travel website template is simply impressive. 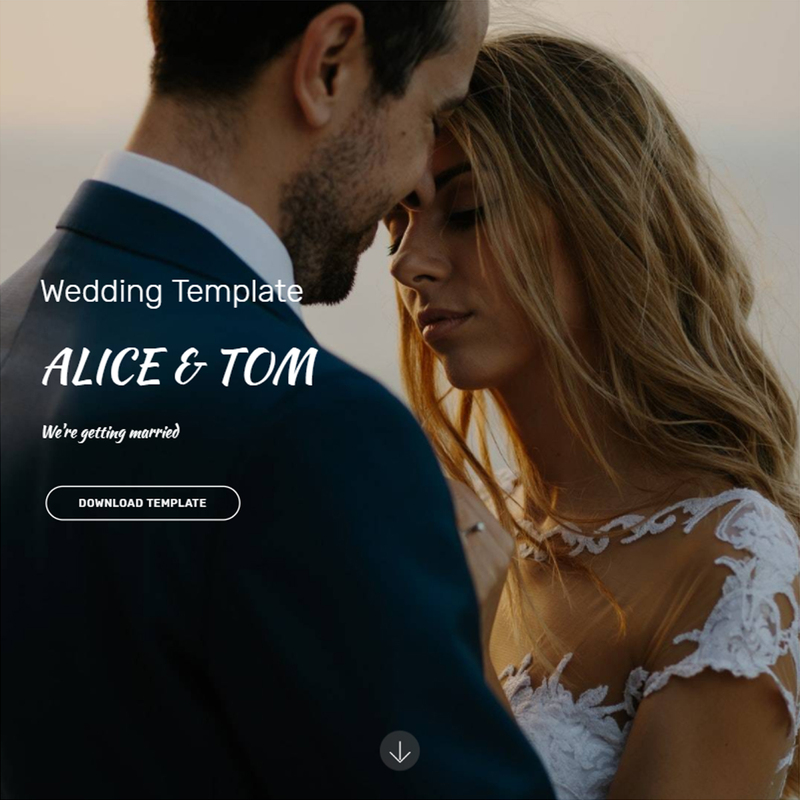 It provides you with user-friendly options to modify every segment and part of the theme, edit the styles and add new sections like colorful full-screen page intros, big background pictures with parallax effects, footers with thumbnails and others. 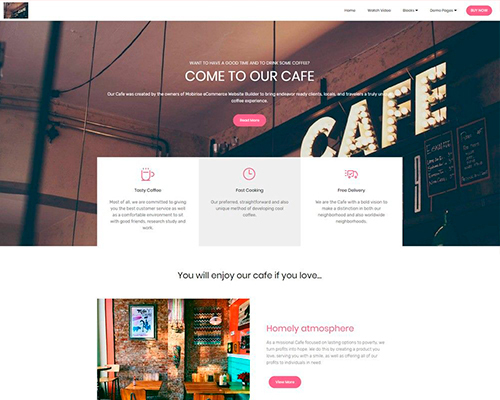 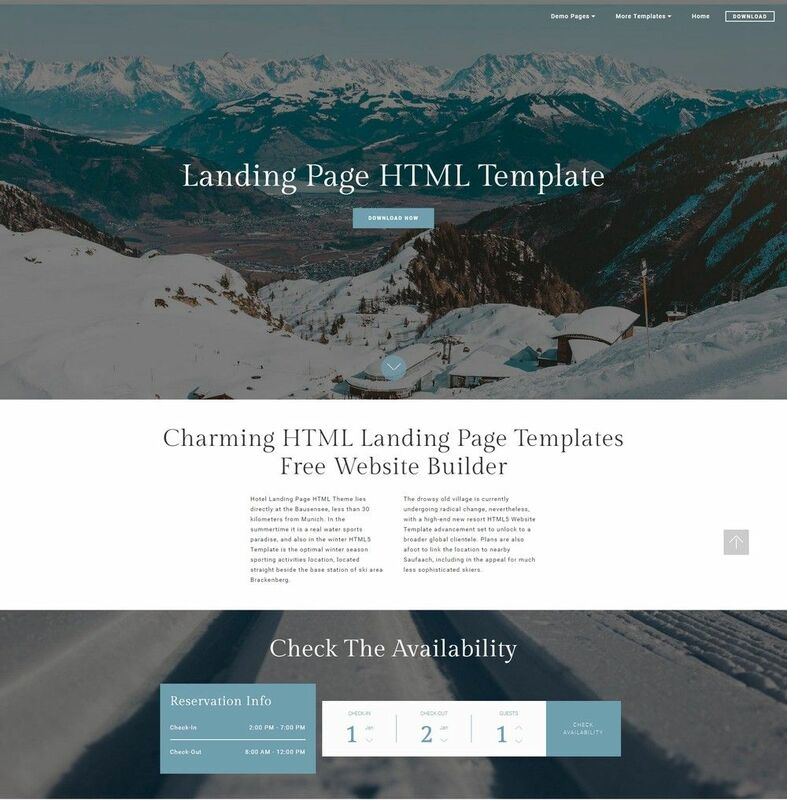 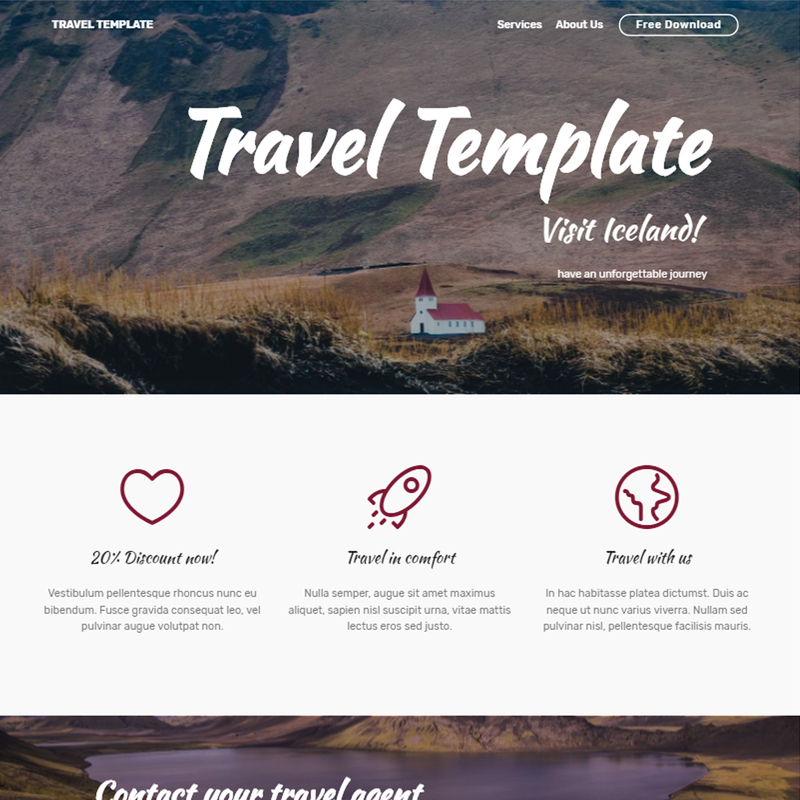 For those who need a landing page for their travel agency or other companies and organizations, there is this creative and highly easy-to-use template. 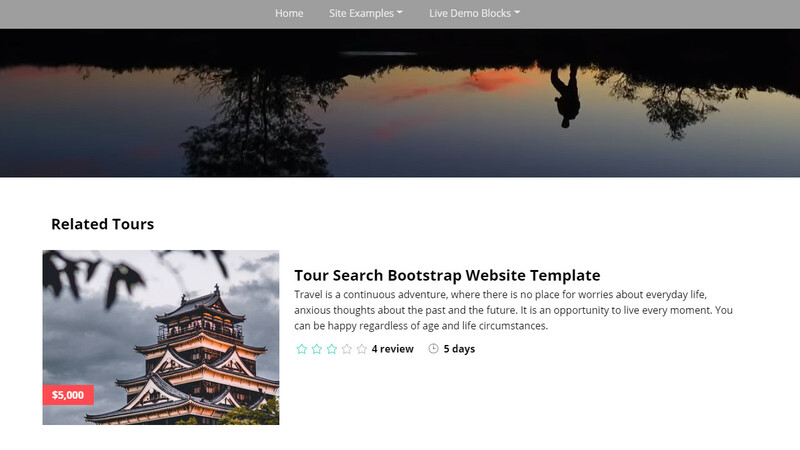 Easily add and change offered blocks like related tours with animations of cards, popular destinations, video backgrounds, single blog posts and much more. 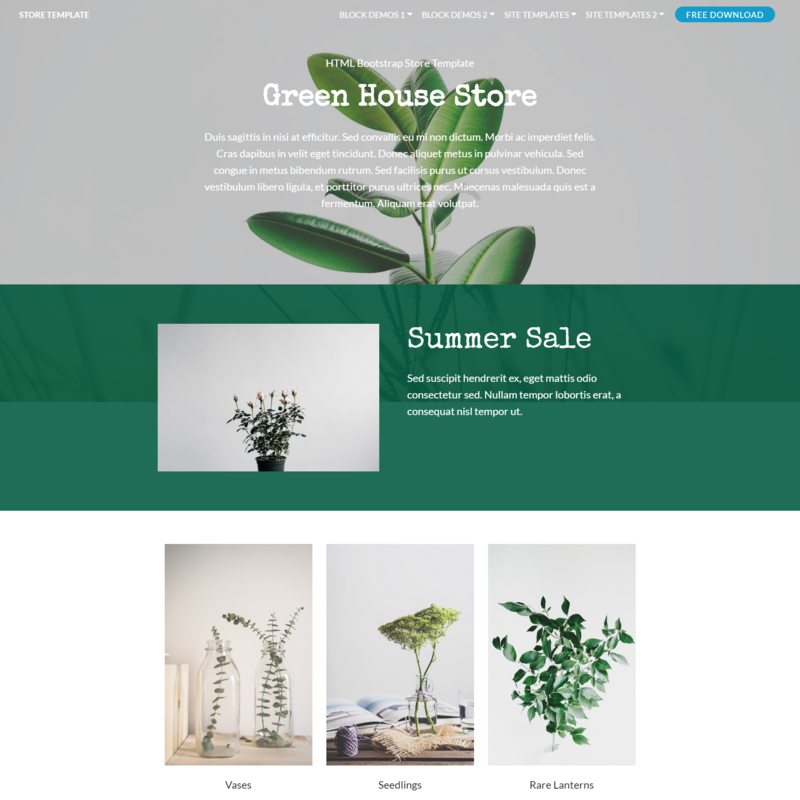 Creating an eCommerce website manually is a difficult task. 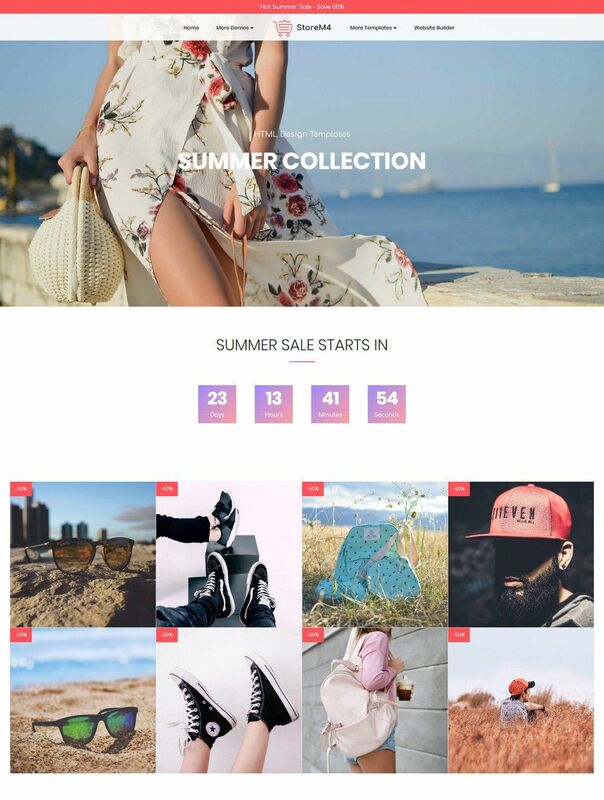 But it's super easy with HTML5 eCommerce Theme with the inbuilt website builder. 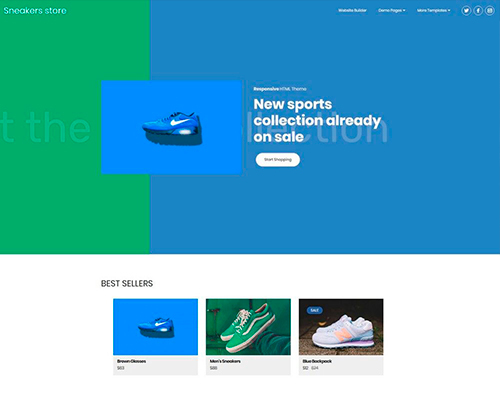 With this theme you're able quickly and easily to set up an online store in no time flat just moving website blocks and designing them with a few mouse actions. 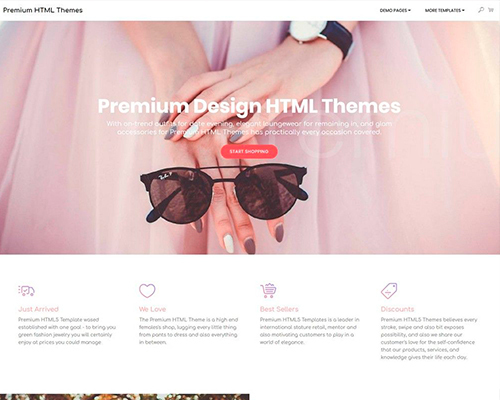 This template looks elegant and attractive which will definitely make your buyer stay on your page and help you increase your website traffic. 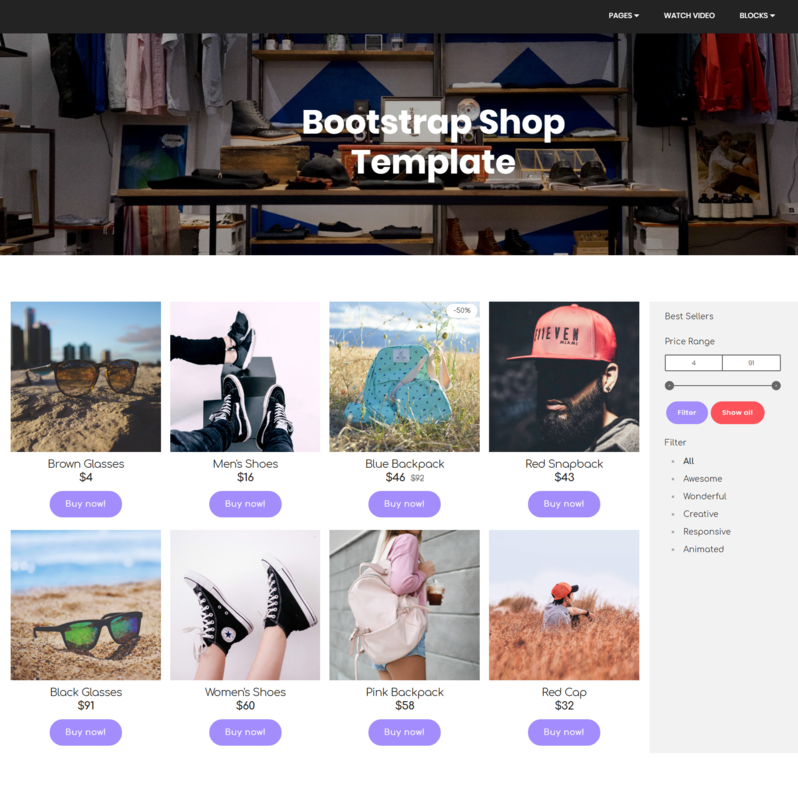 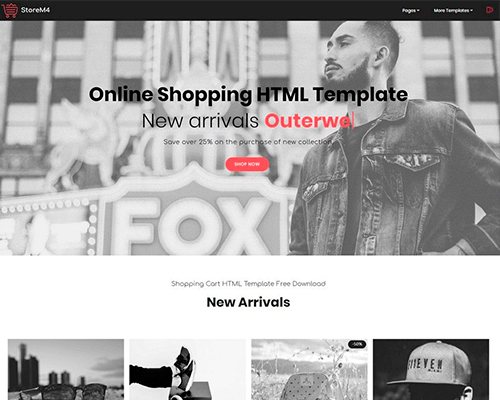 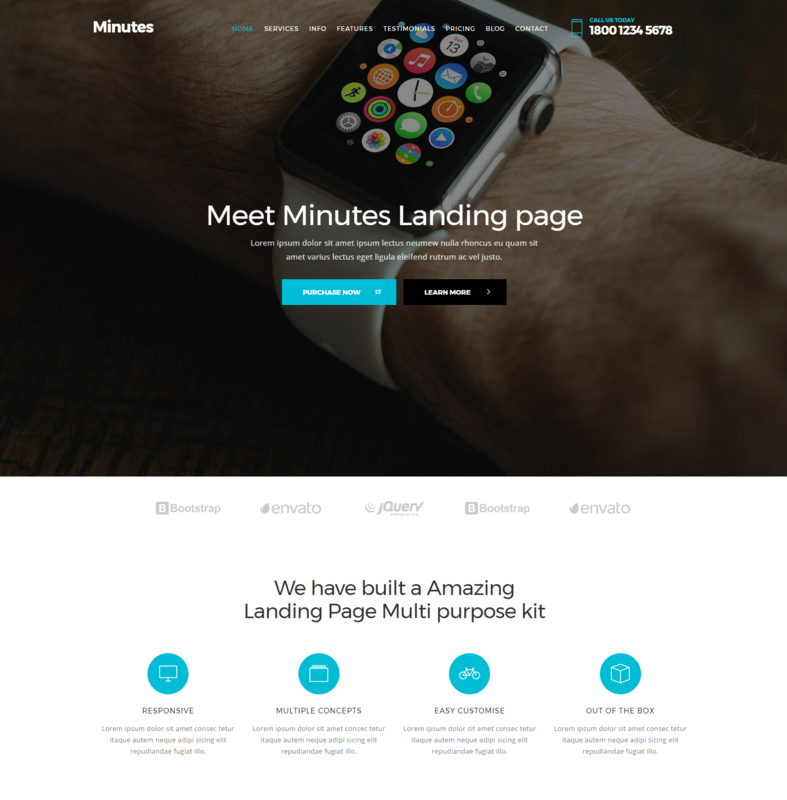 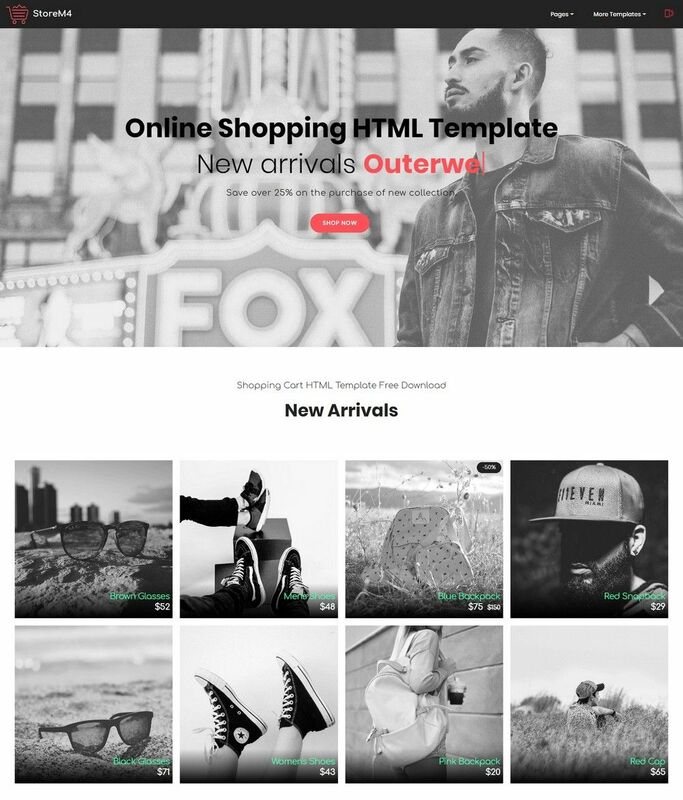 This Shop template lets you build e-shops in a matter of minutes. 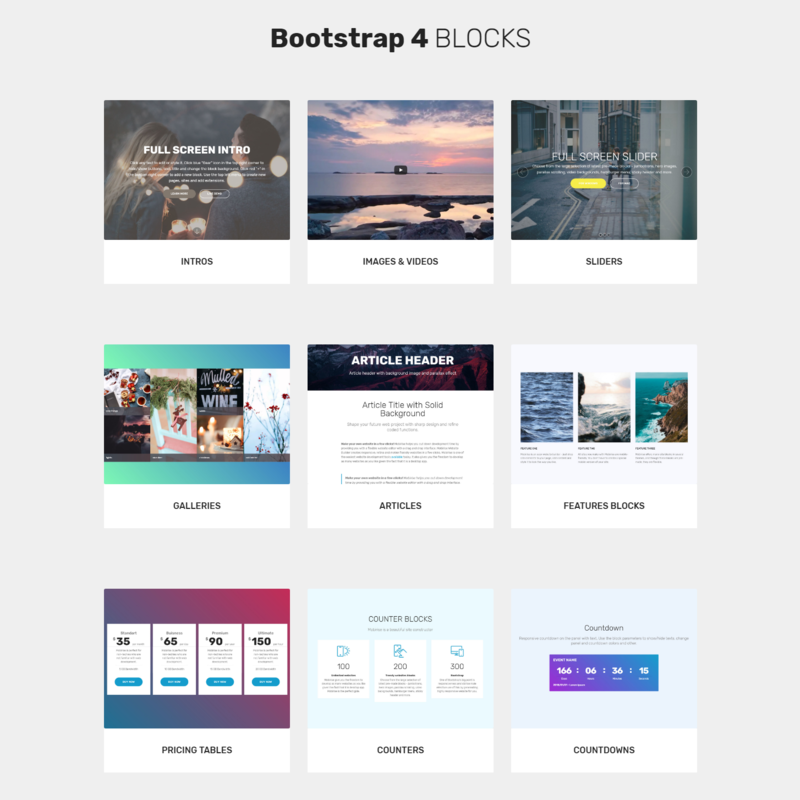 Use astounding shop blocks to showcase your items and articles. 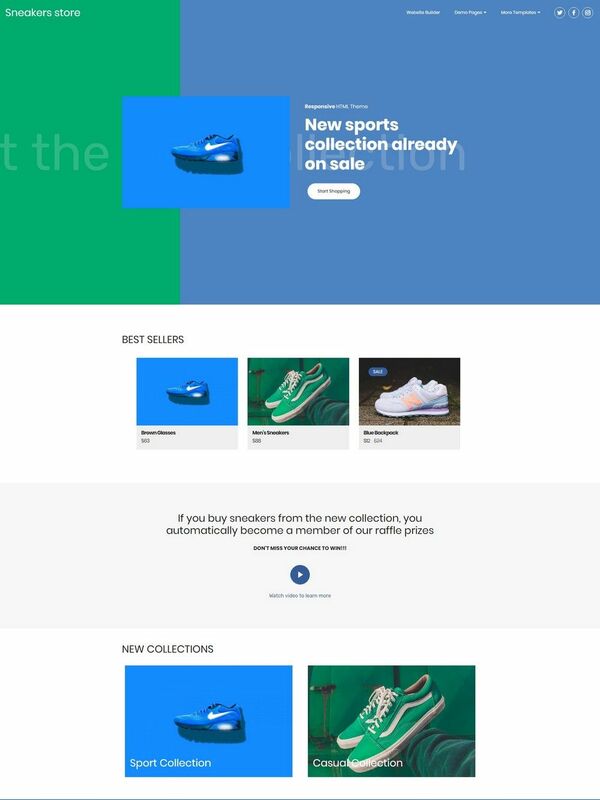 Add product descriptions with no effort. 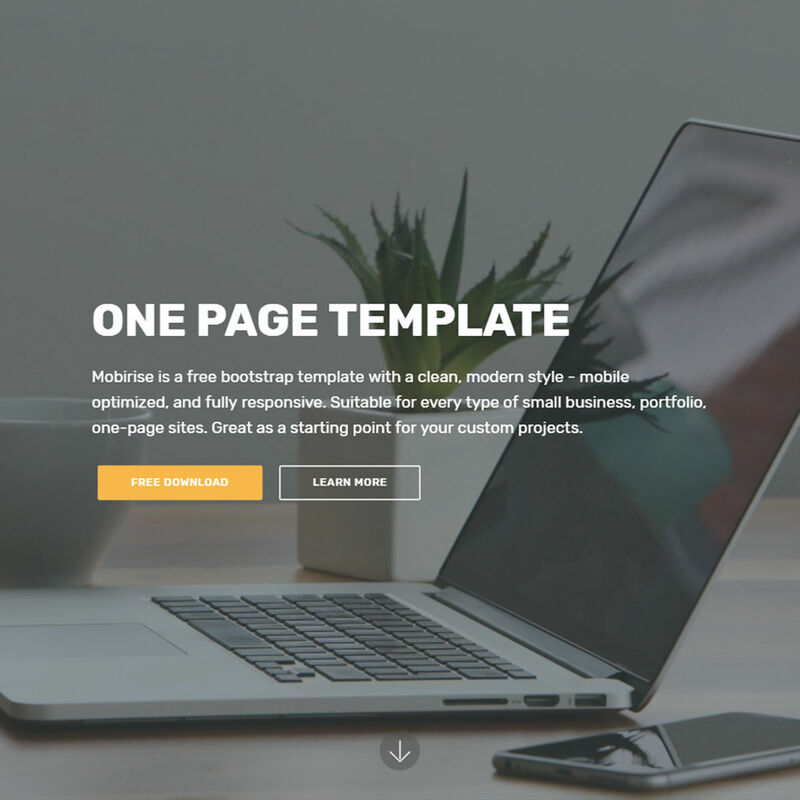 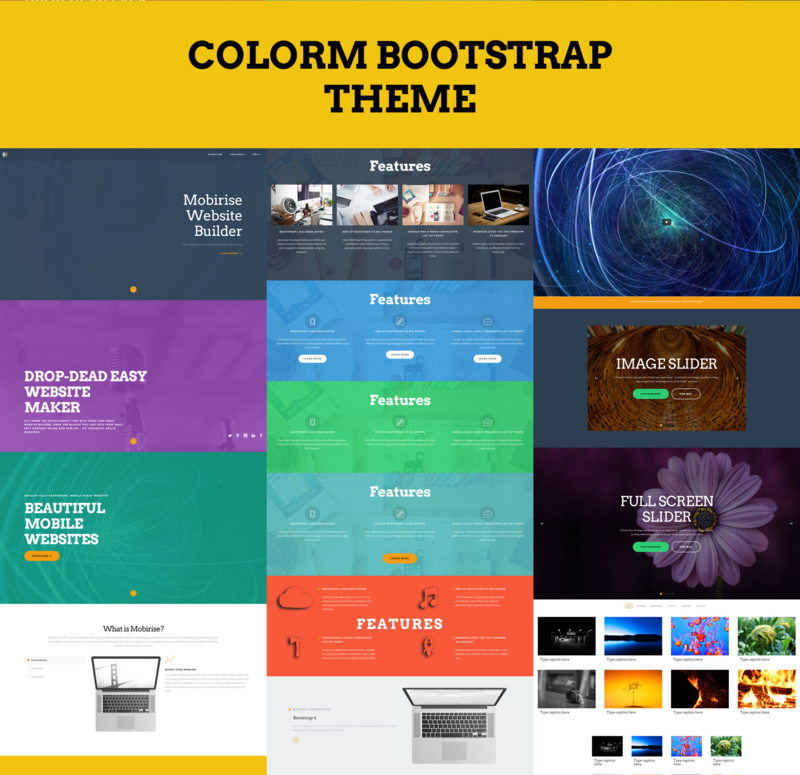 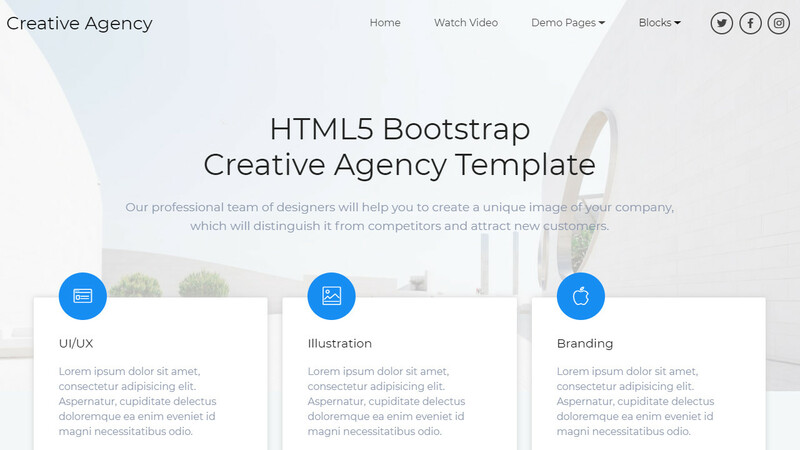 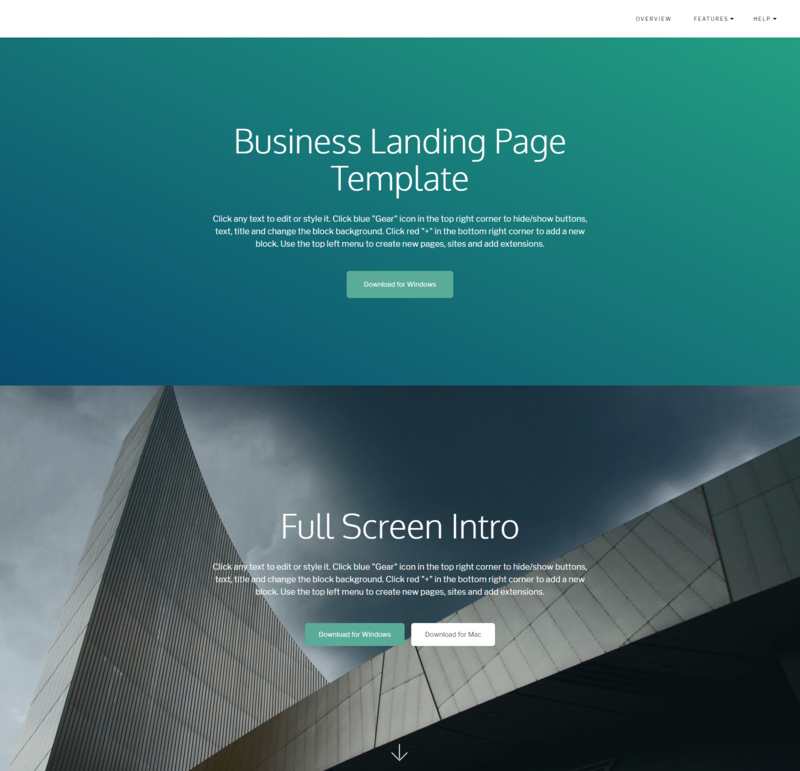 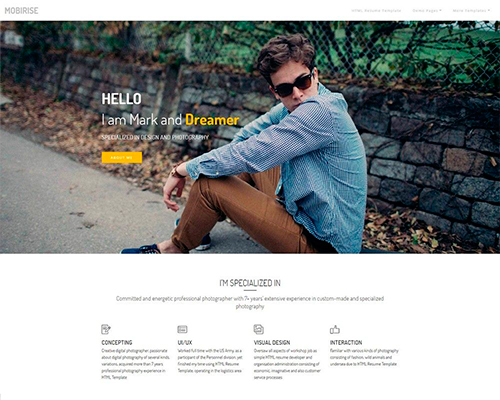 This Bootstrap Responsive Template will wow your site audience with color-rich headers. 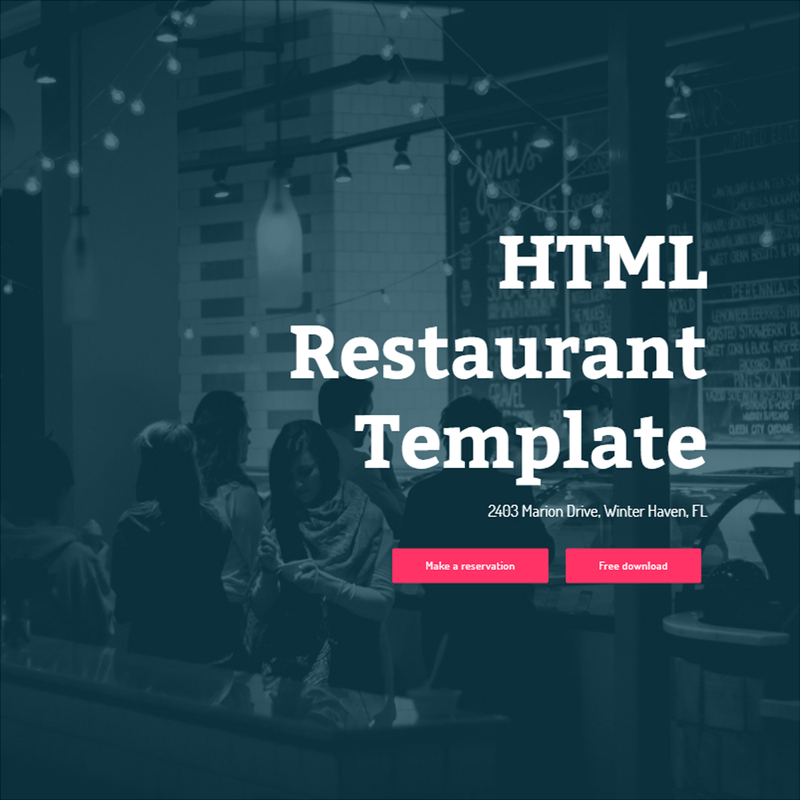 It enables you to create image or video backgrounds, rounded buttons, set up contact forms, testimonials and place maps on your page. 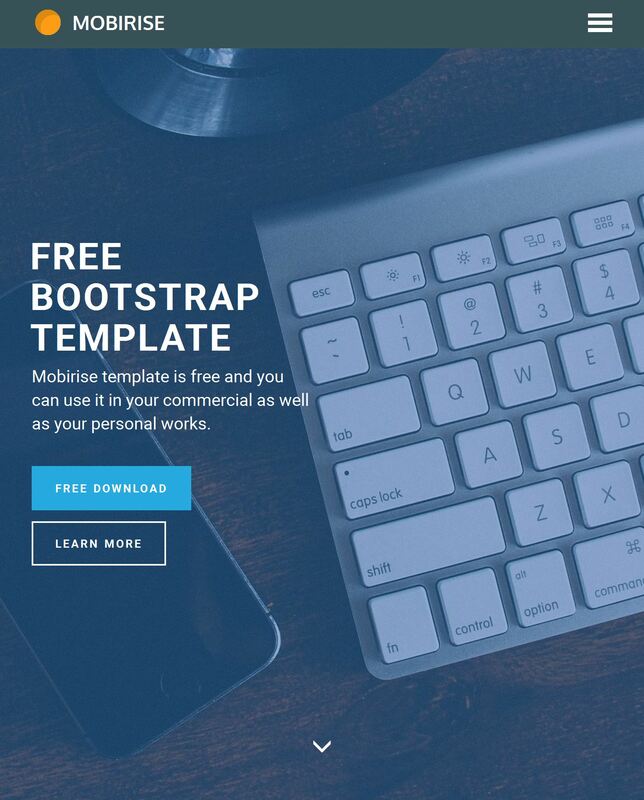 This is a free one-page HTML template for iOS and Android app promotion. 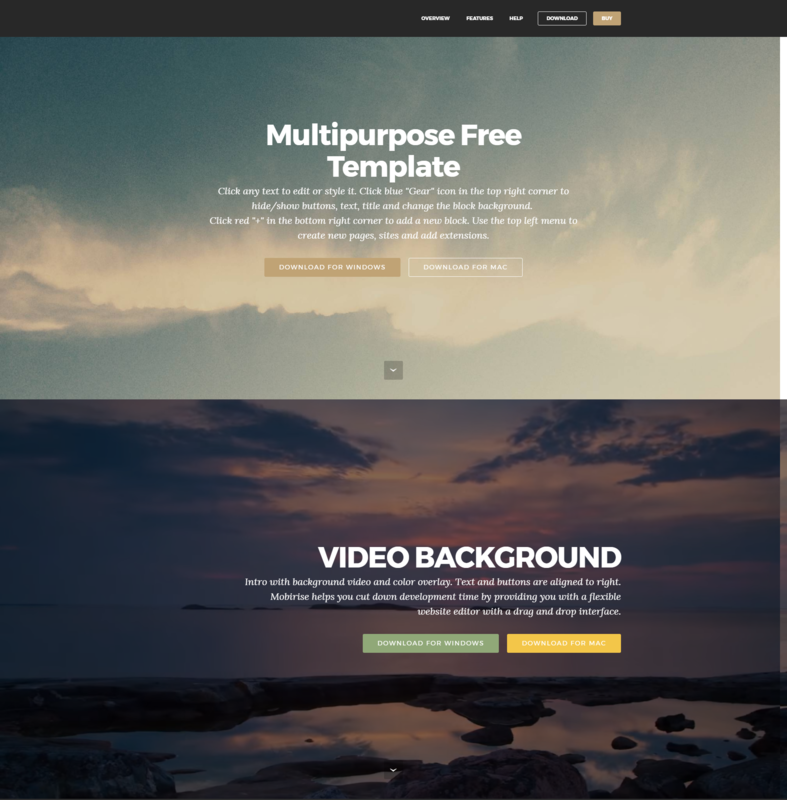 The template is fully editable to place testimonials, pricing tables, features description, and intro blocks with a video parallax background. 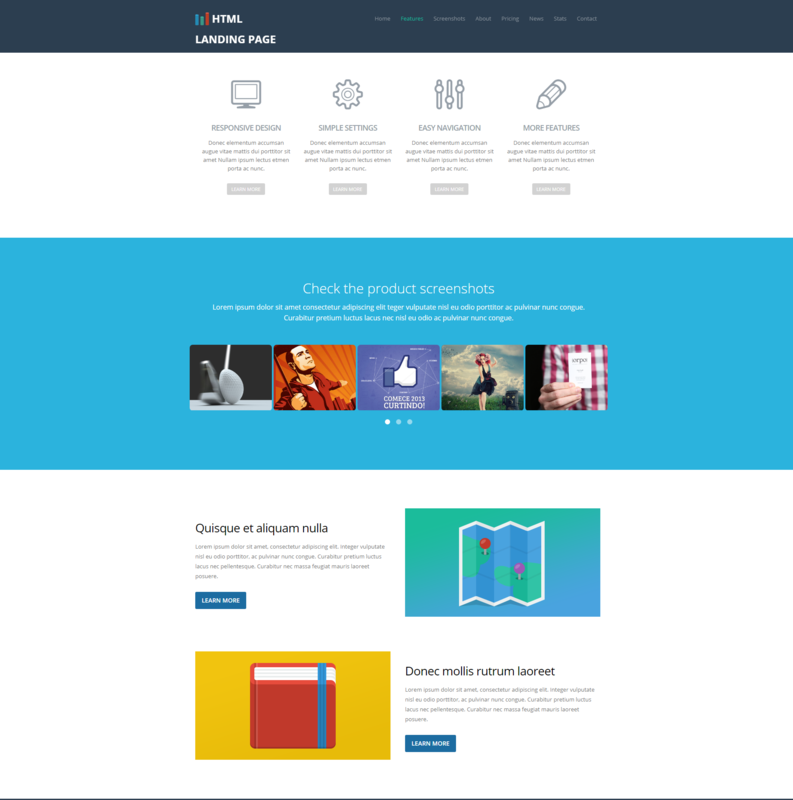 Create a responsive website with resume, portfolio, coming soon and service showcase pages. 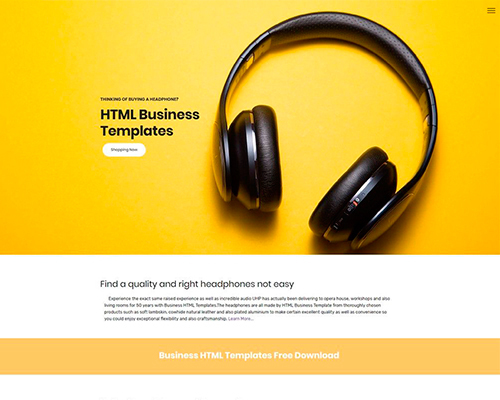 The template comes with 50+ modern web blocks (sticky menus, full-screen intros, parallax, video backgrounds, carousels, sliders, image galleries, icon boxes, blog posts, testimonials, social share, pricing tables, subscribe forms, contact forms, footers) and 4 pre designed pages which will give you full options to build a unique website in a matter of minutes. 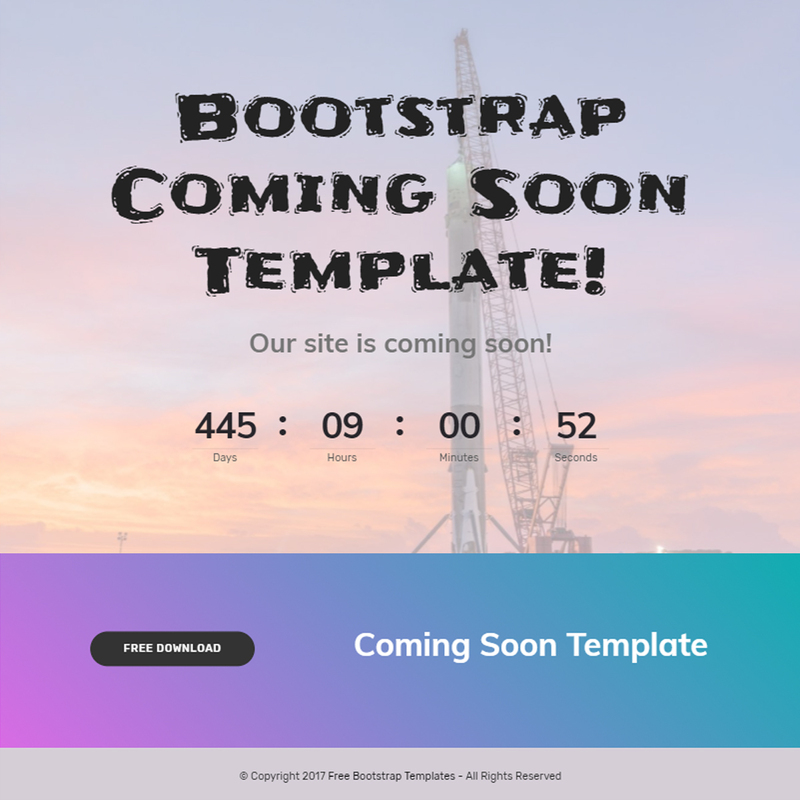 Neat and laconic "coming soon" / "under construction" one-page BS4 template. 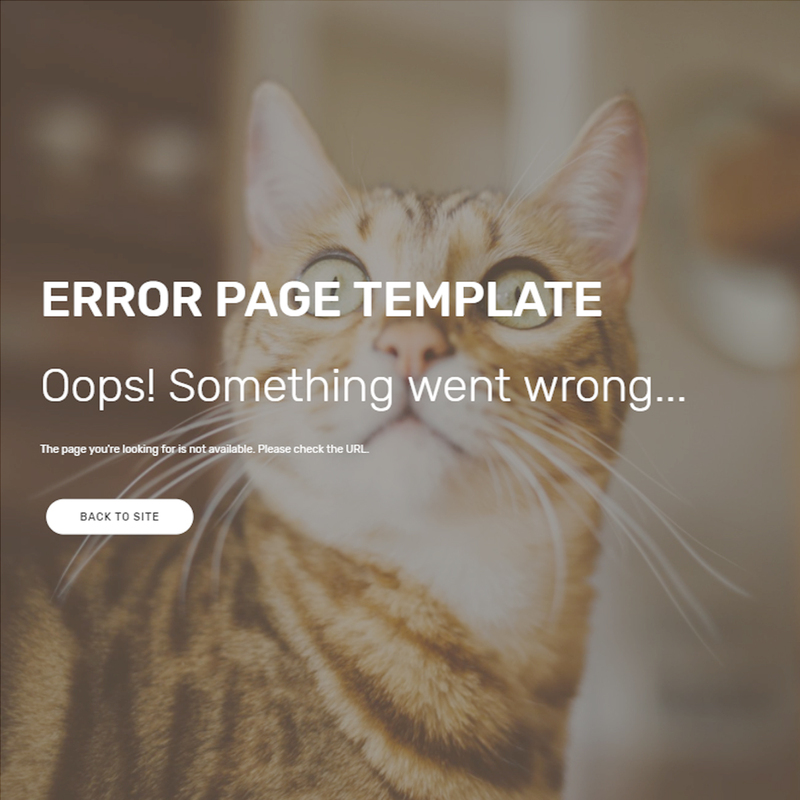 A full-screen intro element includes a amazing counter, an animated text element and a subscribe form. 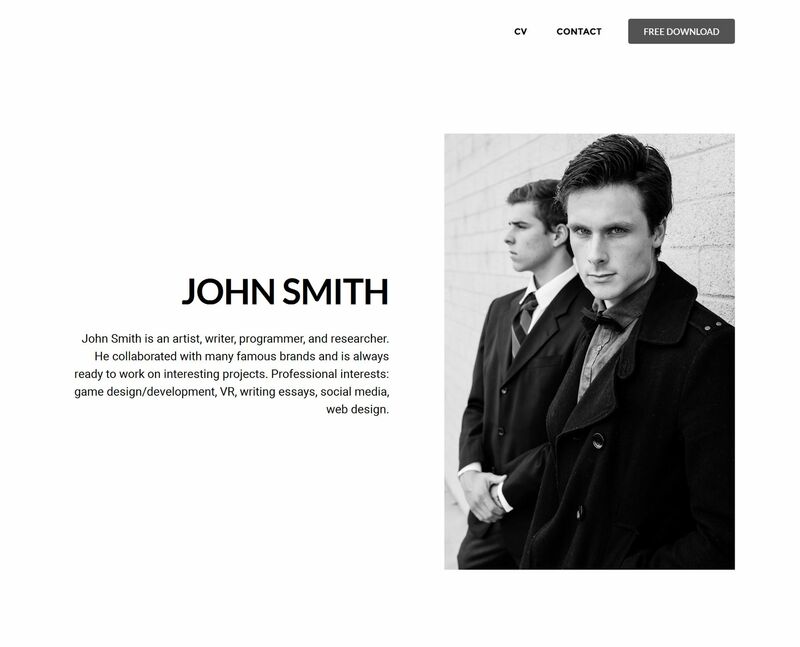 Portfolio demo template includes several pages: a masonry gallery, full-screen parallax images, and a project description. 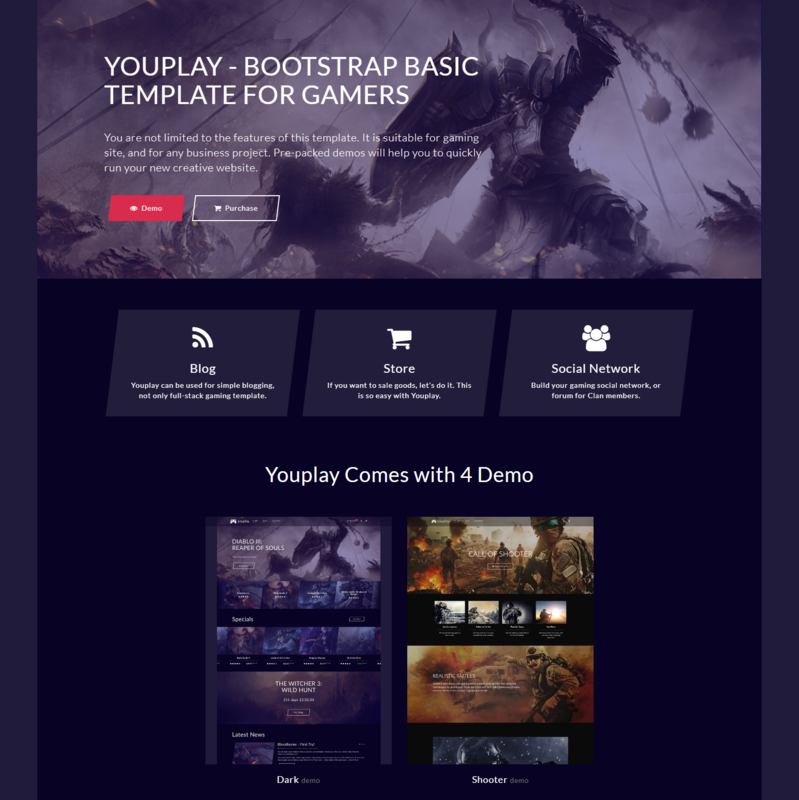 It looks awesome and also fully functional. 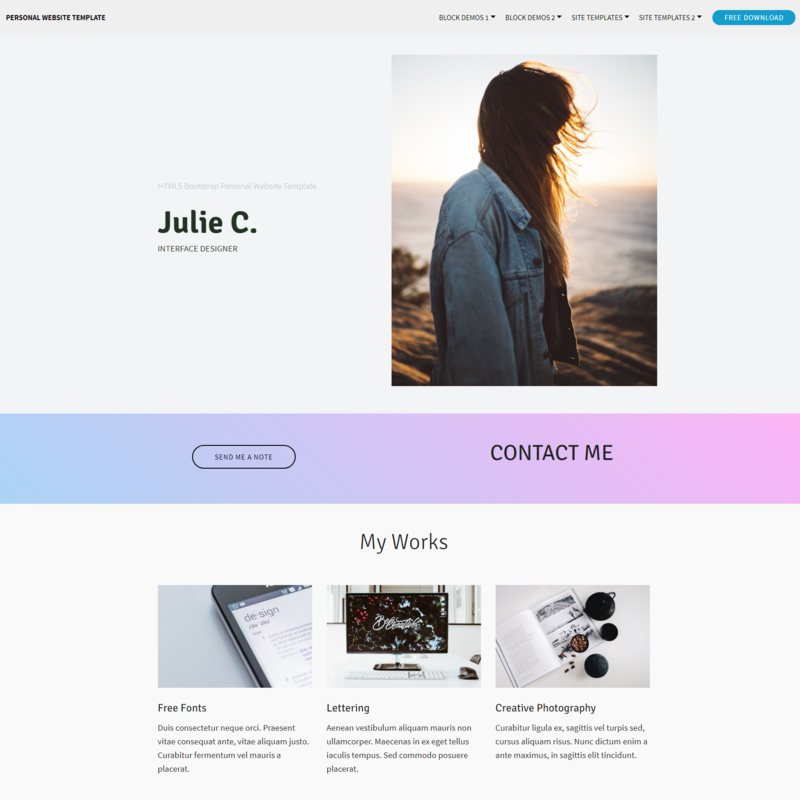 This BS theme is perfect for those who want to place information about their professional skills online: education, experience, awards and works. 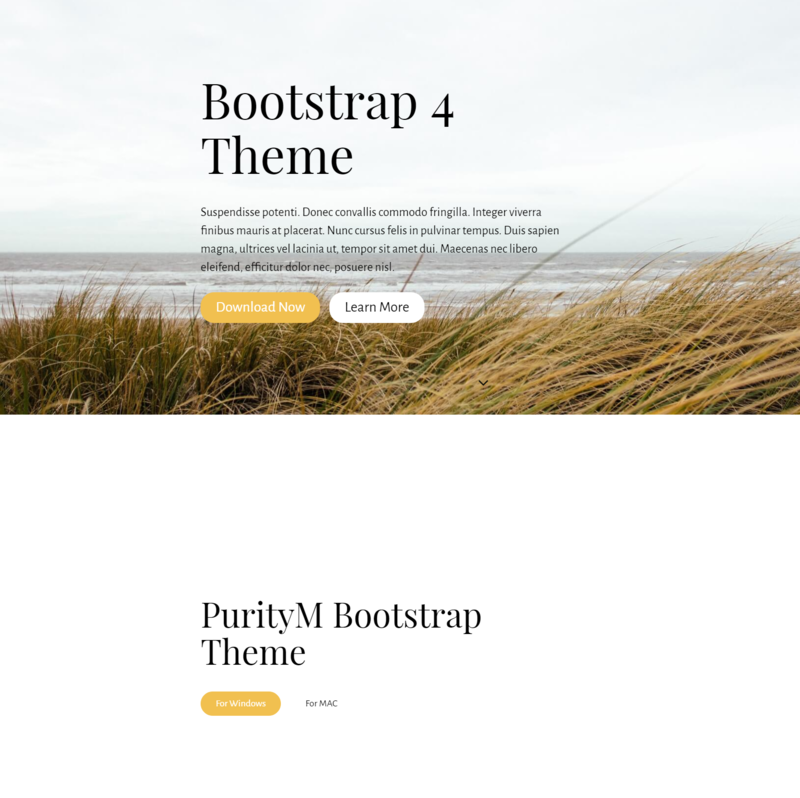 Modern, clean, but yet flexible design based on Bootstrap 4. 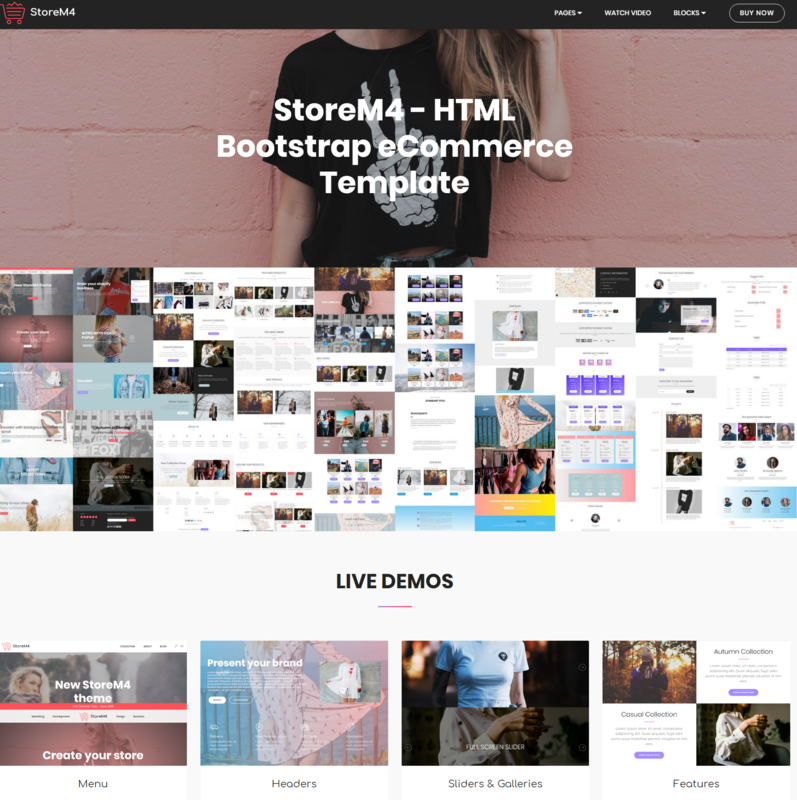 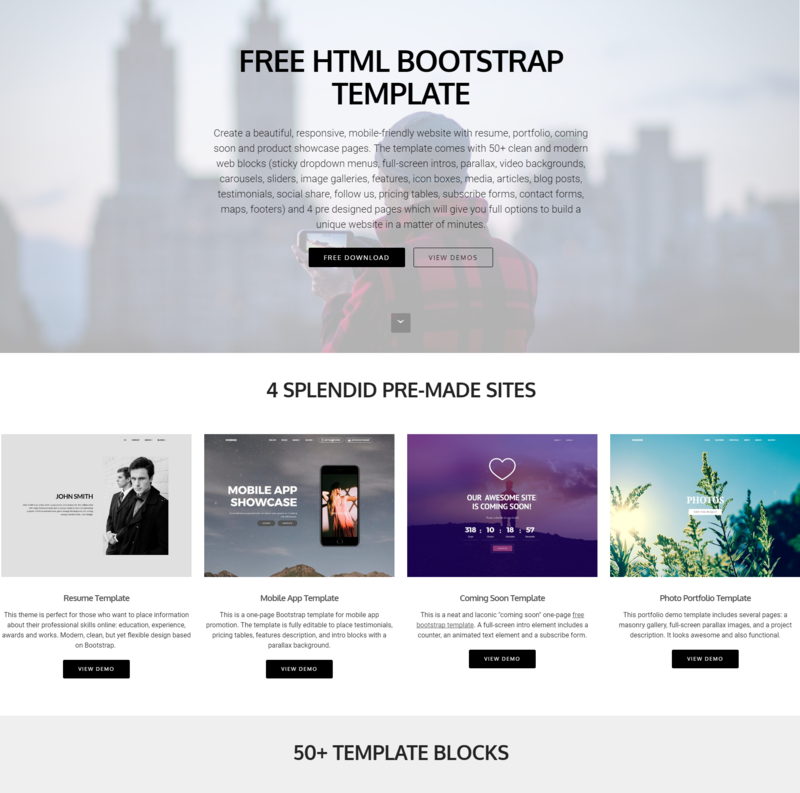 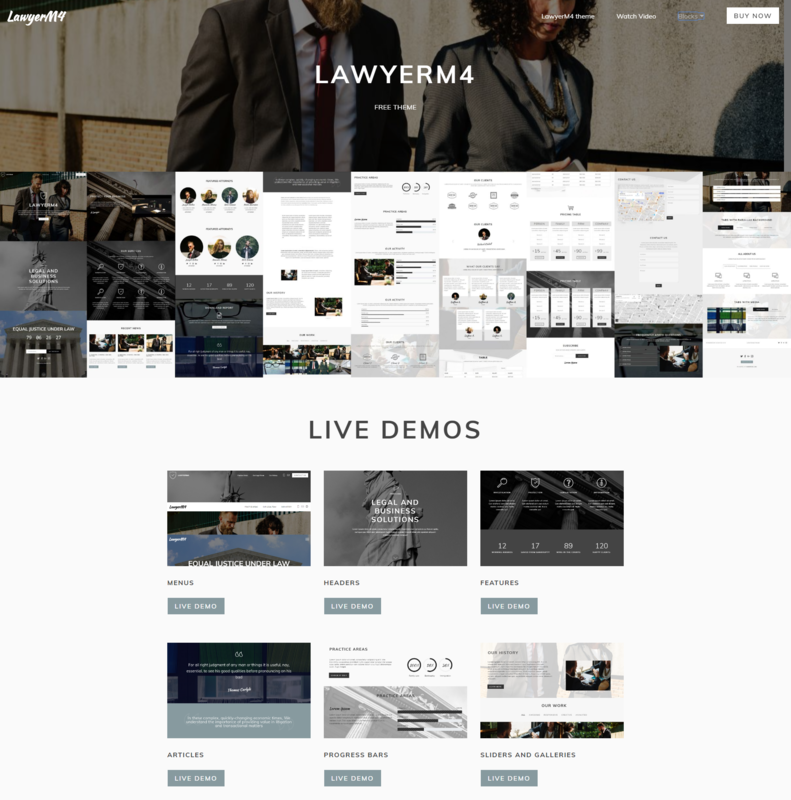 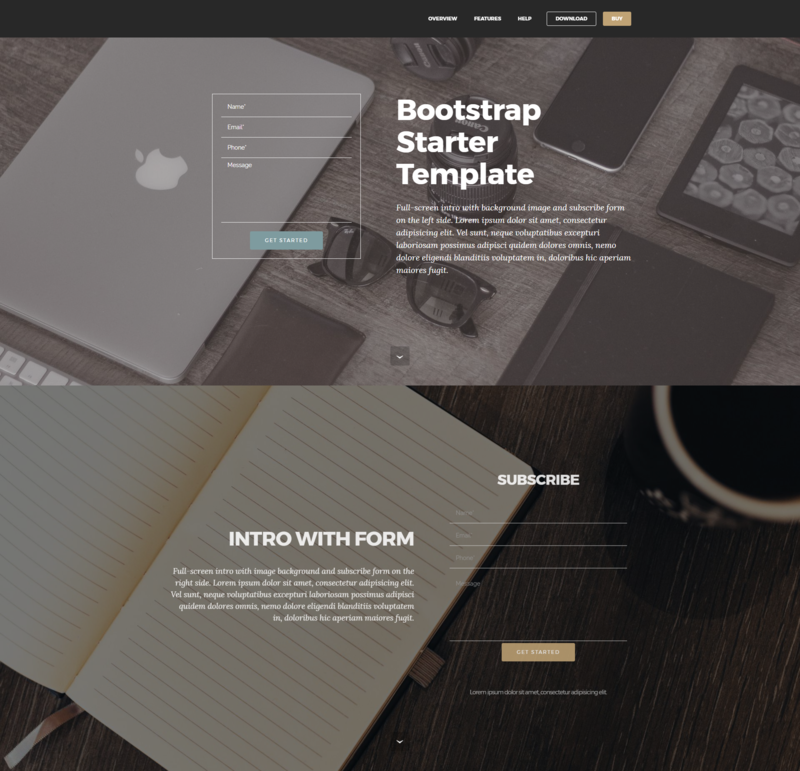 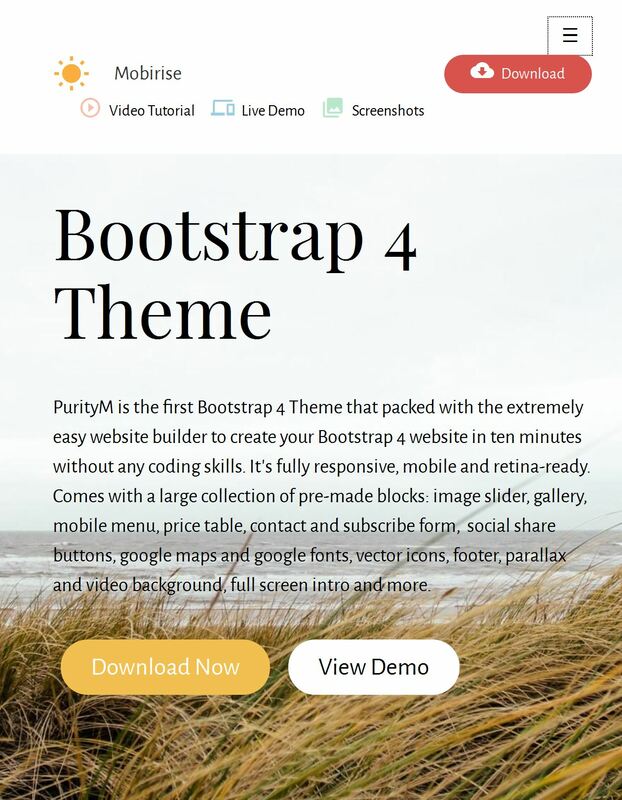 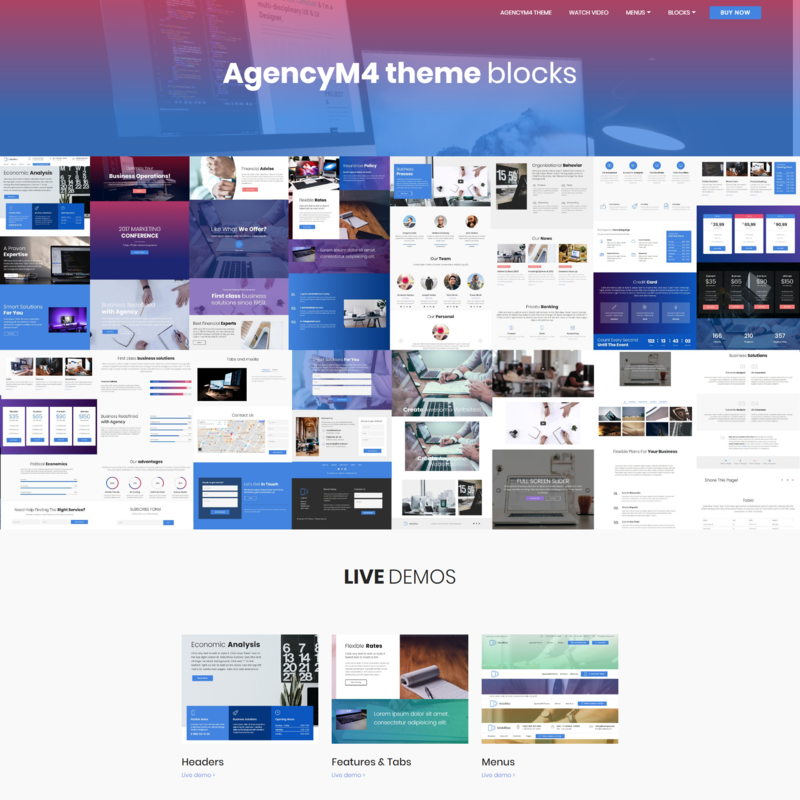 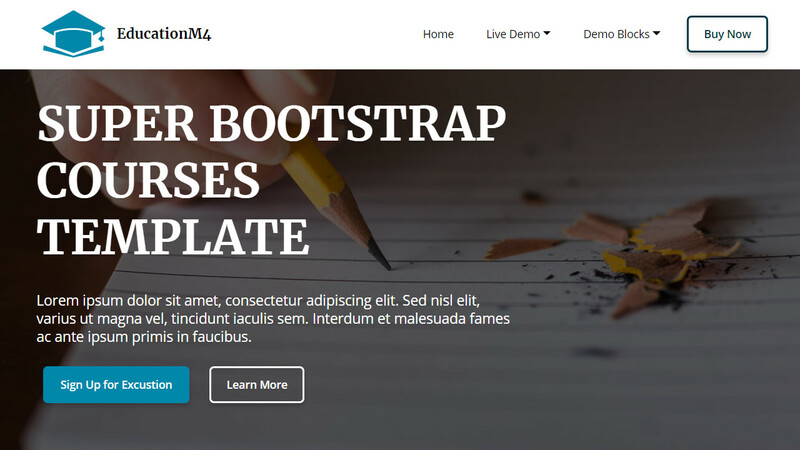 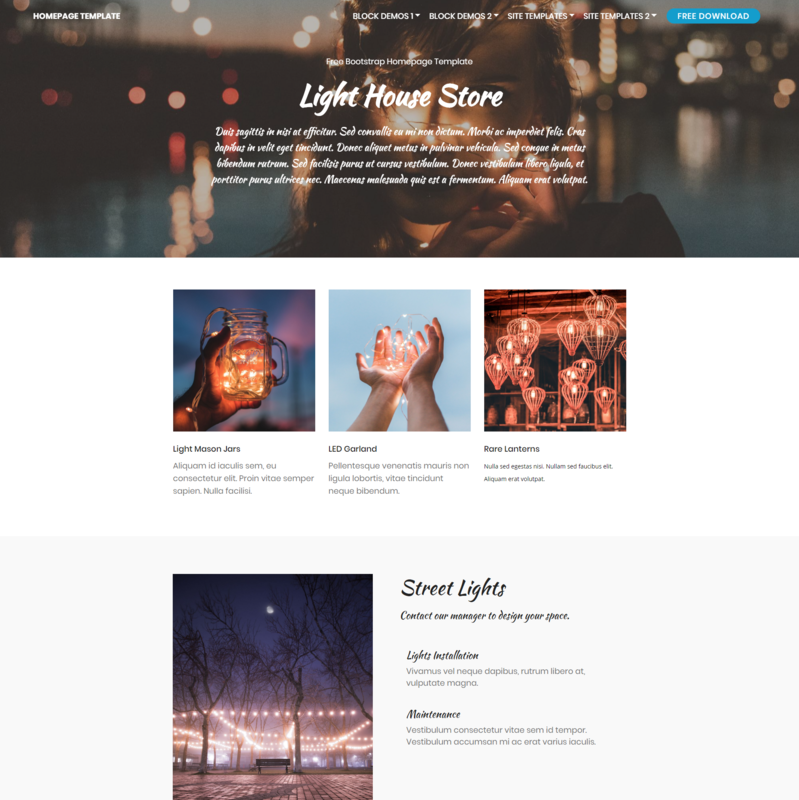 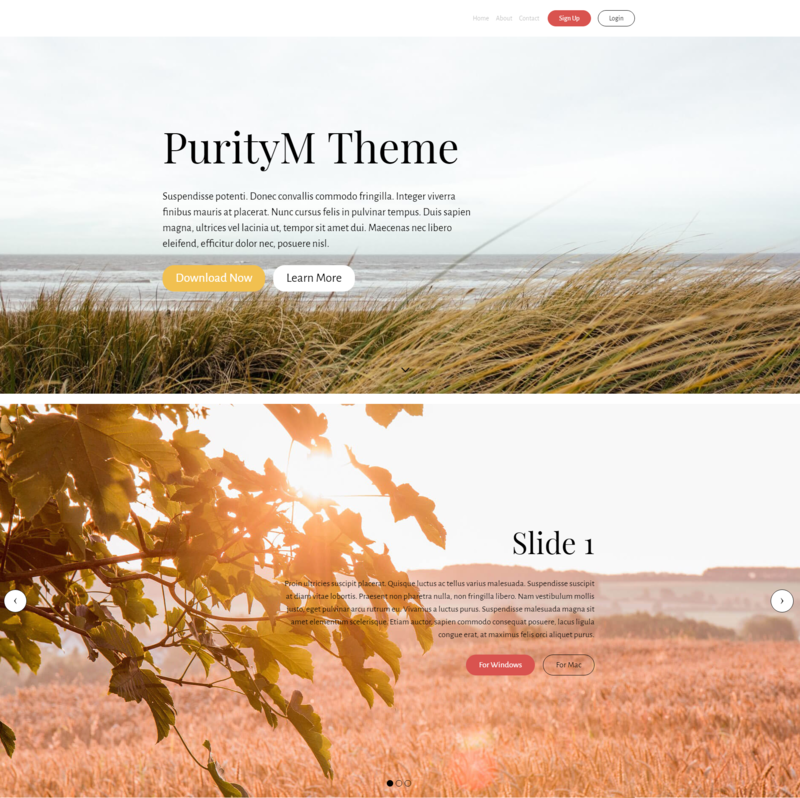 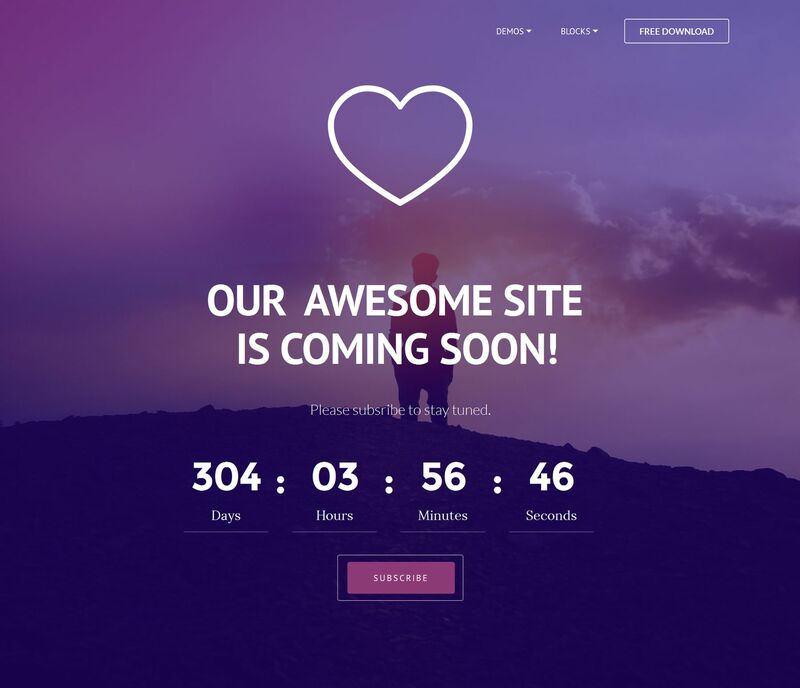 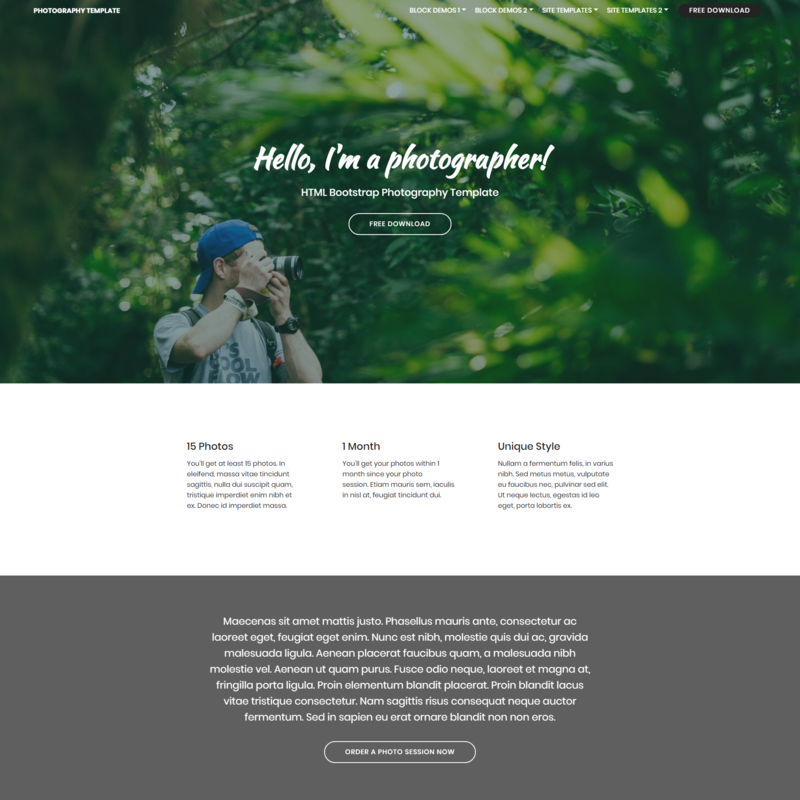 PurityM is the very first Bootstrap 4 Theme that packed with the exceptionally easy website builder to produce your Bootstrap 4 site in ten minutes with no coding abilities. 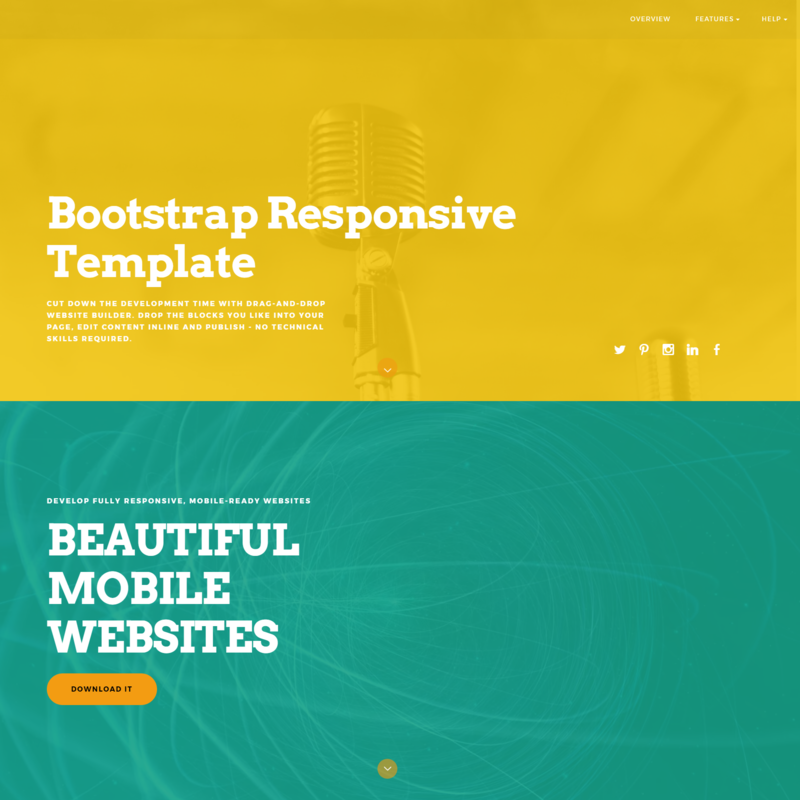 It's mobile, totally responsive and retina - ready. 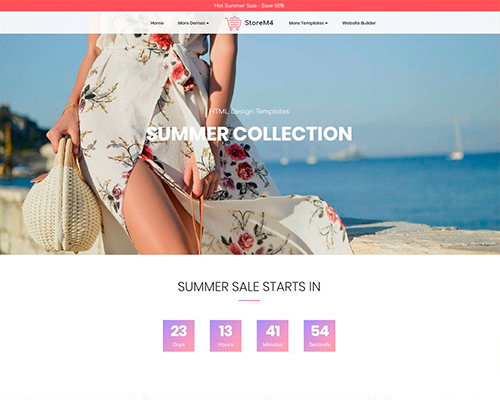 Includes a large collection of pre-made blocks: picture slider, gallery, cellular menu, cost table, subscribe form, social share buttons, google maps and google fonts, vector icons, footer, parallax and video background, full screen intro and more.